Okay, I am officially running around like a crazy person this week getting ready for one of my best friend’s bachelorette parties this weekend! I’m so excited to get a weekend with my girls – and I’m sure I’ll have some fun things to share with y’all when I return! 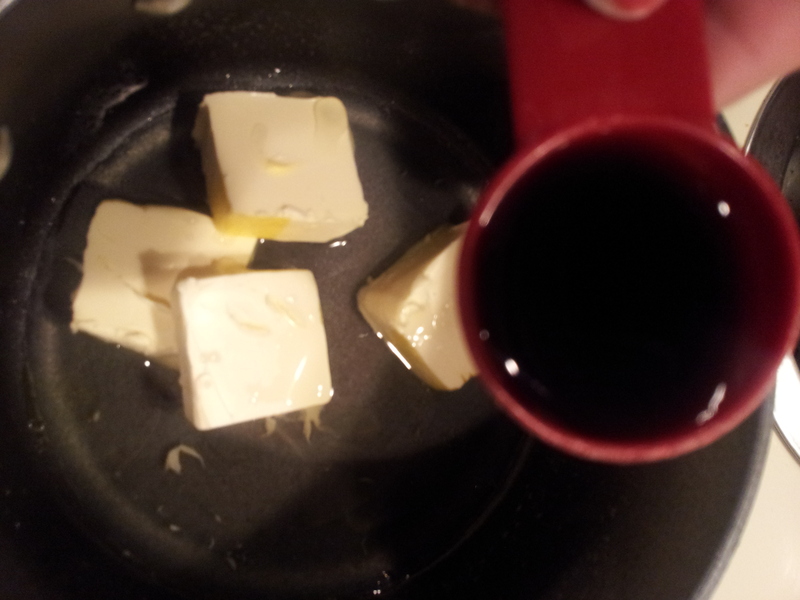 So when I find myself super stressed out, for some reason, I turn to the kitchen. I recall one time in college I gave up sweets and caffeine around Valentine’s Day. Not to cut back on calories, but to prepare my body for a 48-hour dance marathon! Well, I got super stressed out and turned to baking. Yes, that thing I have a love/hate relationship with. I made a ton of cookies, peanut butter and chocolate rice crispy treats, brownies and another type of cookie. Luckily we had male neighbors in our apartment building…so home-baked treats were easy to pawn off on them! The other day, I went for something more practical and good for me so I wouldn’t be extra stressed trying to shed pounds from eating a bucket of baked goods! 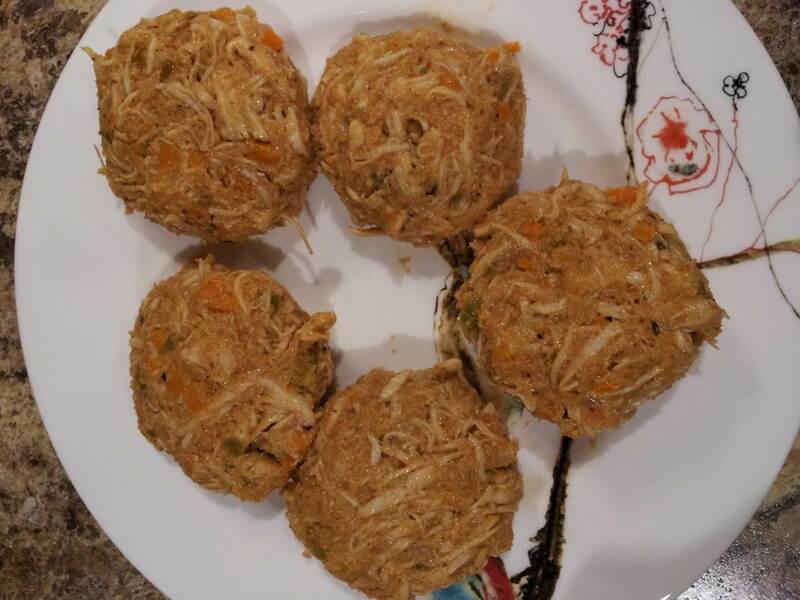 I had written down a recipe a while back that I ran across on a fabulous website (she also does WW recipes!) 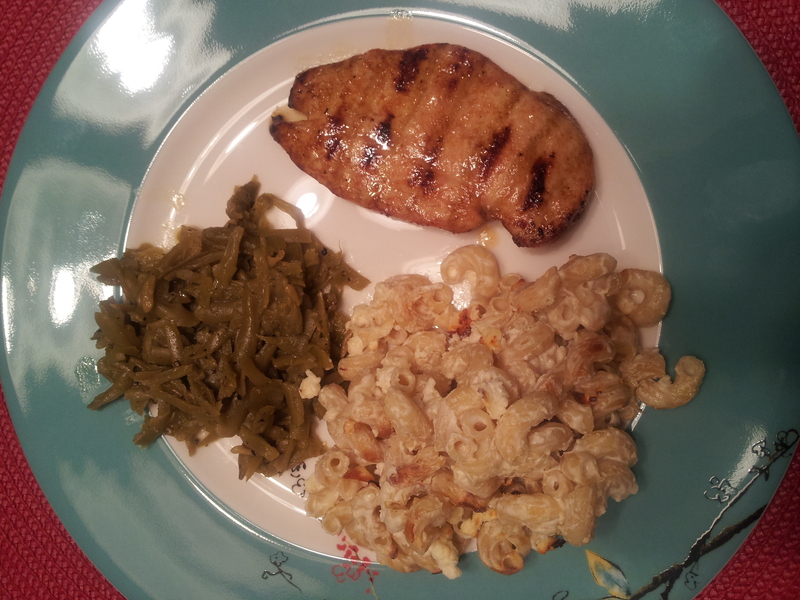 and so with a big ole chicken breast thawed, I decided to try a new recipe for dinner. About 1-2 hours before you’re ready to eat, whisk together garlic, mayo, sour cream, mustard, lime juice and chipotle powder until smooth. Refrigerate for 1-2 hours. Bring a medium pot of water to a boil and add the chicken. Reduce to medium-high and cook 15-20 minutes until chicken is cooked through. 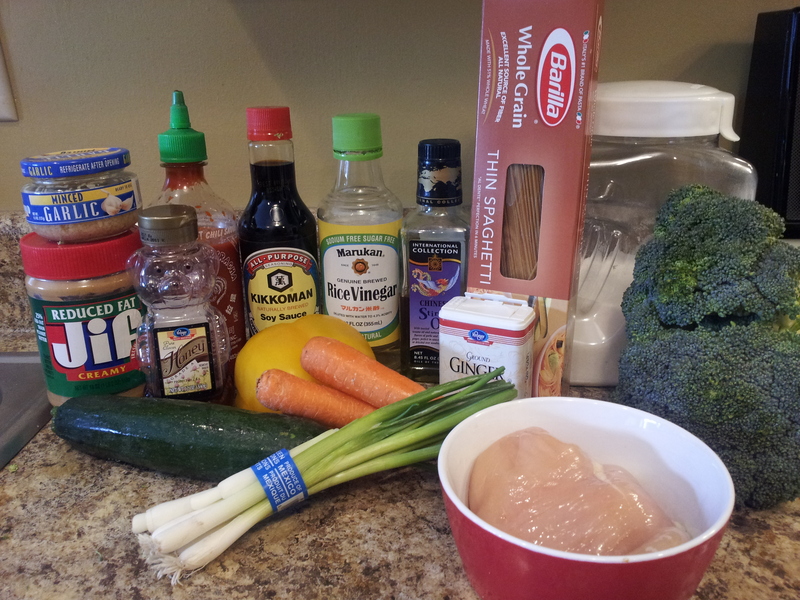 While chicken is cooking, go ahead and chop your veggies. 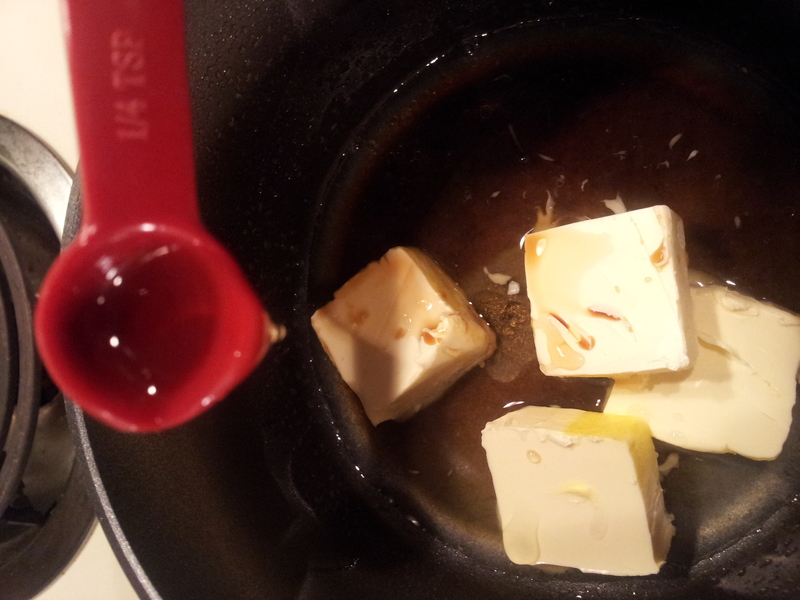 Saute them in 1/2 Tbsp. margarine. 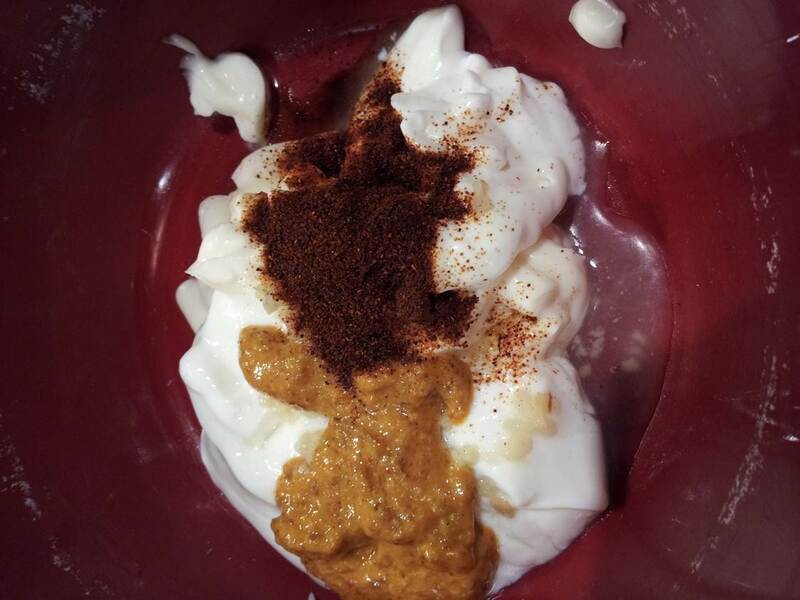 In a small bowl, mix together mayonnaise, egg, mustard, Worcestershire, chipotle seasoning and salt. Once your chicken has cooked and cooled, chop and shred. 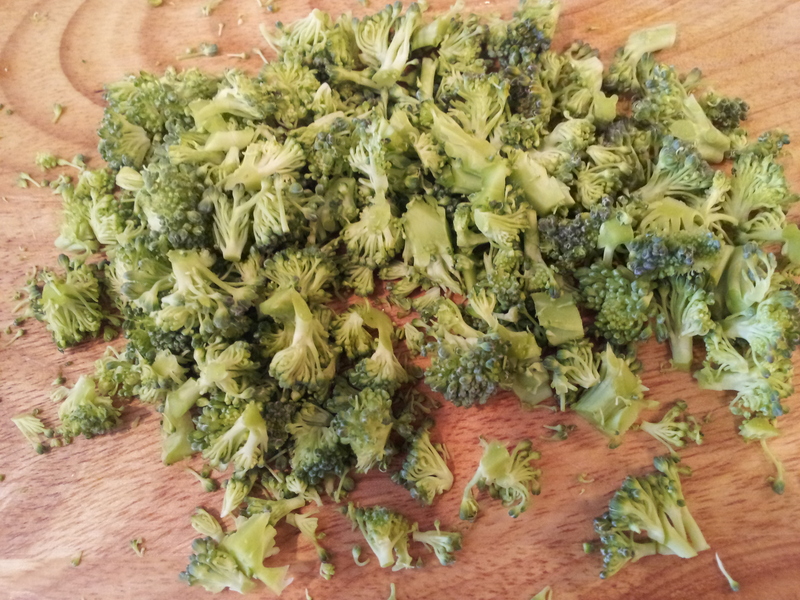 Add to a medium bowl with bread crumbs and add your sautéed veggies and combine. 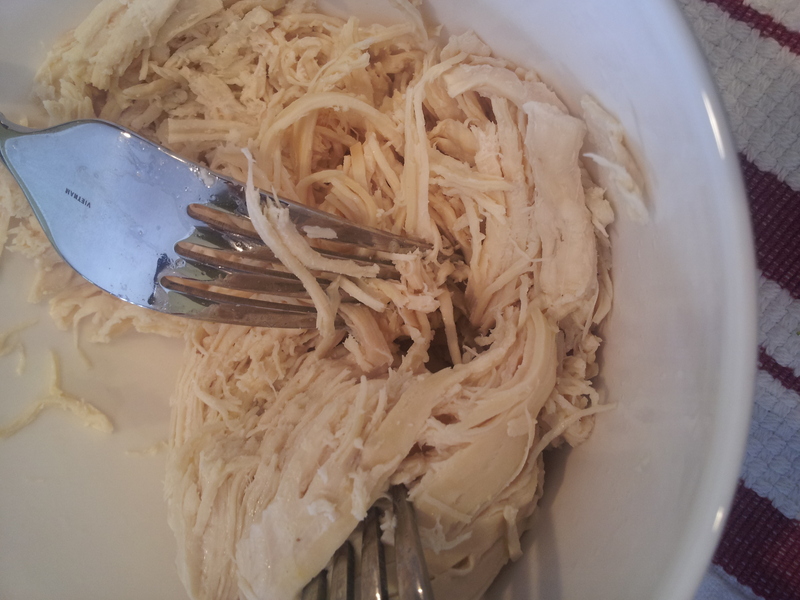 Take the small bowl with the mayo/mustard mixture and add to the chicken. Combine with hands until blended and form into 5 patties. Heat remaining 1/2 Tbsp. 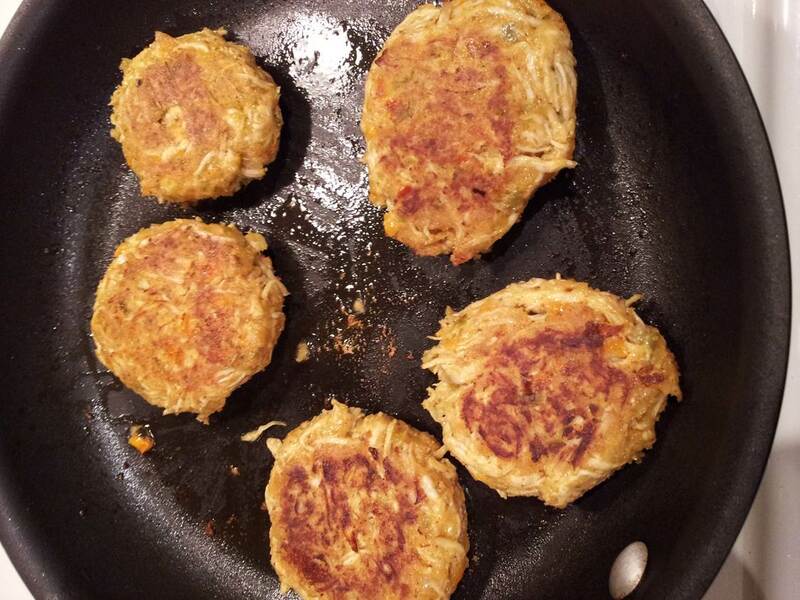 margarine in a skillet and cook the patties over medium heat for 3-5 minutes on each side. Serve with a dollop (or more if you desire!) 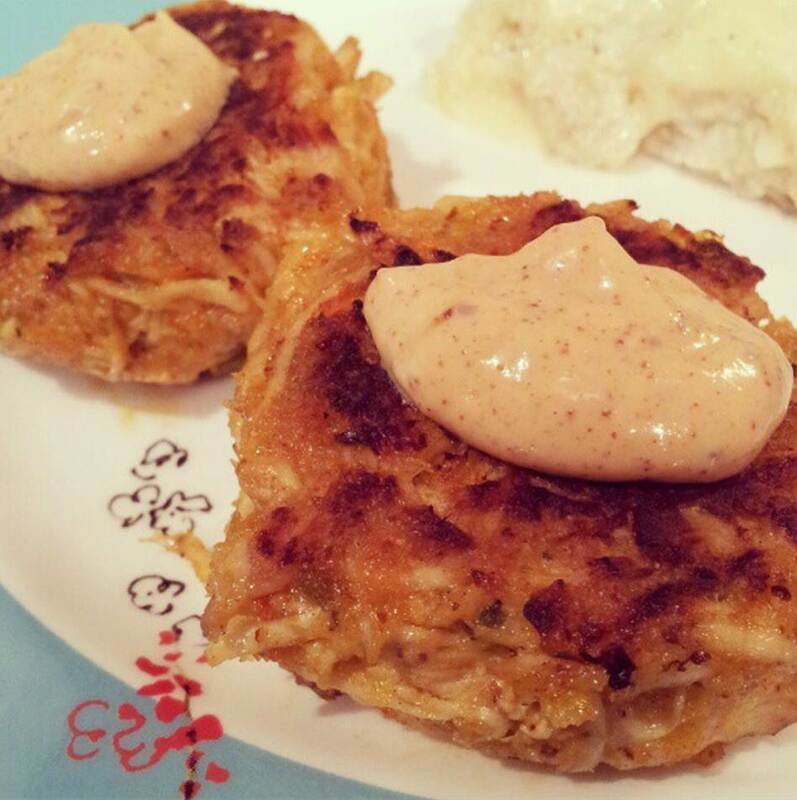 of the spicy mustard sauce and dig in! So it’s rather funny to me looking through pictures of the delicious grilled dish I’m blogging about today – as it has been pouring on and off all day. Listening to loud claps of thunder and rain against the window is quite relaxing – but it is certainly not grilling weather! Good thing it’s supposed to be gorgeous out this weekend though – not to mention my husband takes his exam on Saturday so we get to celebrate with friends on Saturday night at our favorite watering hole! Anyways, I often get wrapped up in making an elaborate meal with lots of ingredients or that requires a lot of time to marinate when it comes to grilling. But this recipe? This is a piece of cake. Well, not really – it’s chicken people. See the title? I served this with my Feta Mac n Cheese and some green beans – but next time, when I actually have groceries in my house, I’m definitely going to throw this together with some potatoes and a crisp green salad! Oh and if there are any of you out there afraid of your grill – don’t be! Embrace it – there is no better time to learn than right now and I promise you, it’s kind of addictive once you’ve learned the ropes. 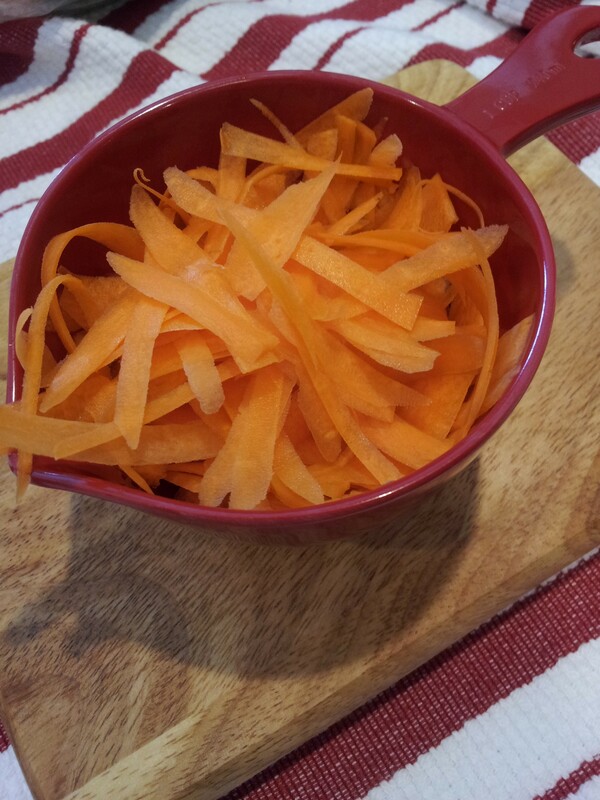 This is a great “starter” recipe…and it’s only 6 WW points per serving! Preheat your grill to about 375 degrees. 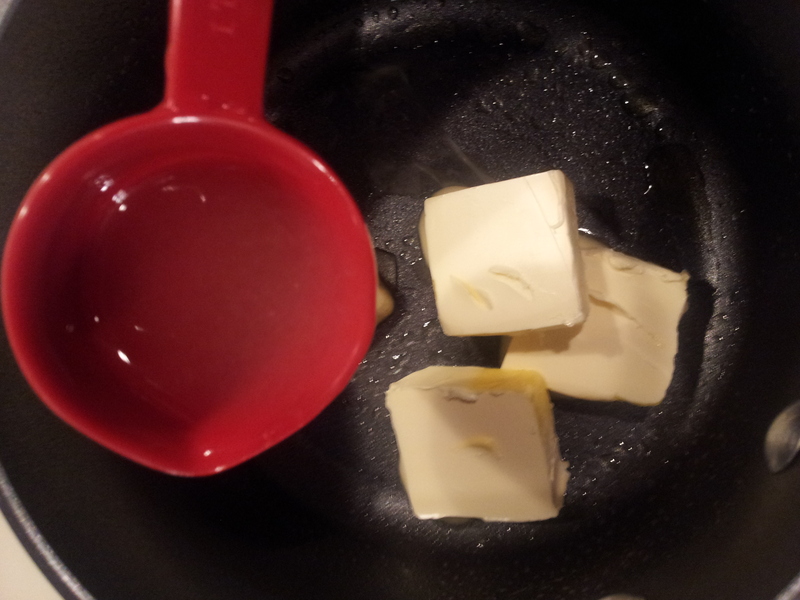 In a small saucepan, heat your margarine. 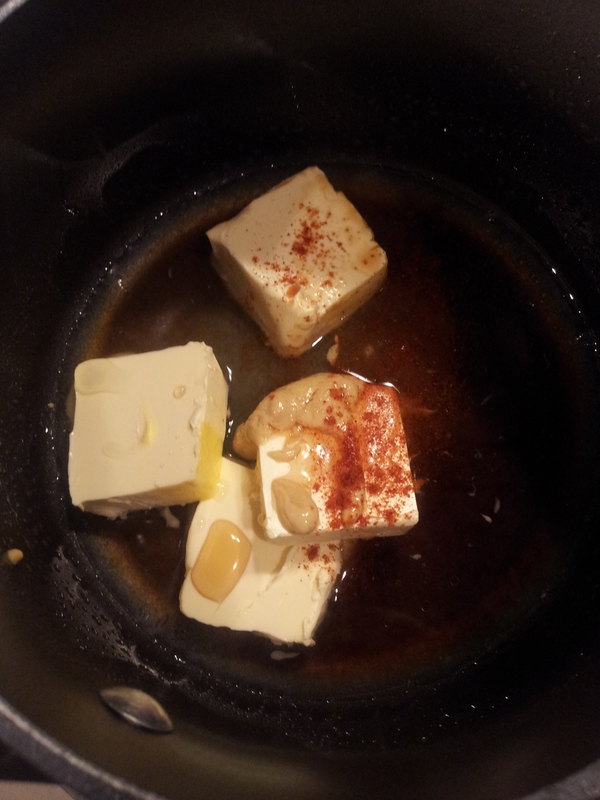 Add your lemon juice, soy sauce, honey, mustard, garlic, salt and cayenne pepper. 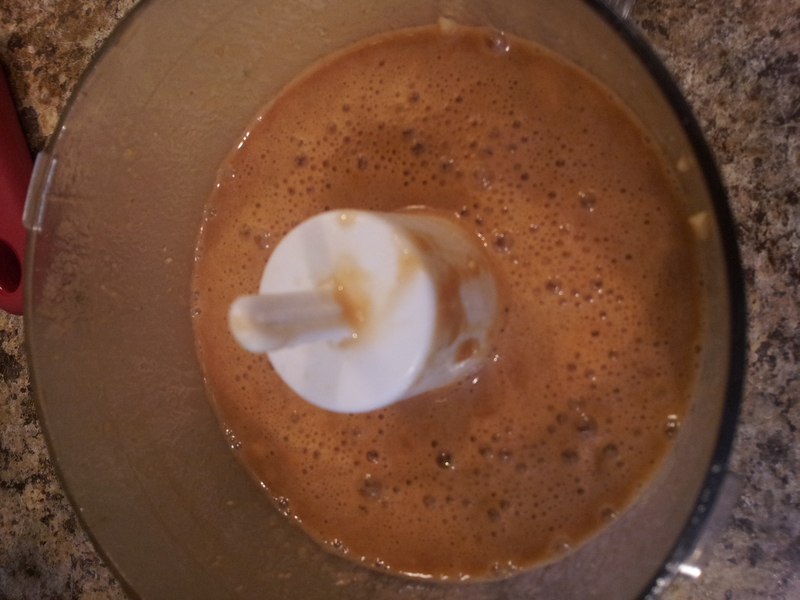 Whisk ingredients together until well incorporated. Now, arm yourself for grilling! 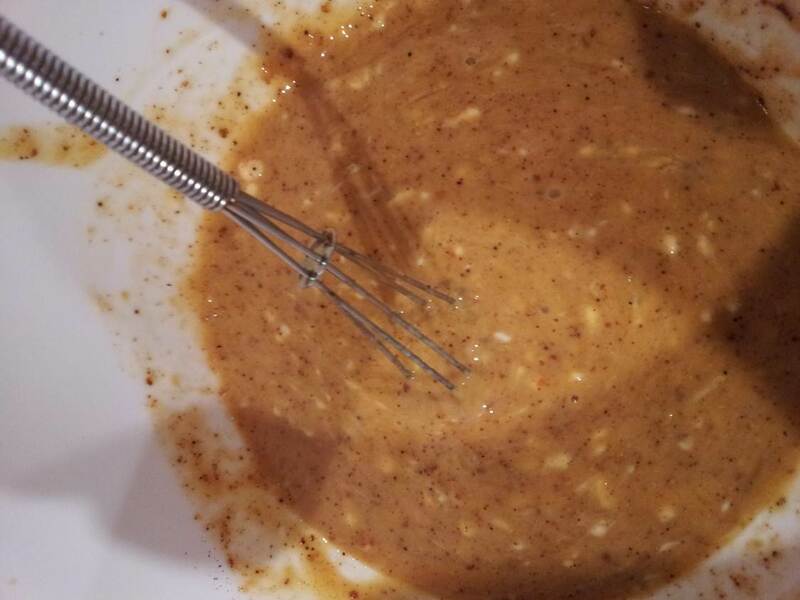 Take your chicken, some tongs, your sauce and a basting brush. 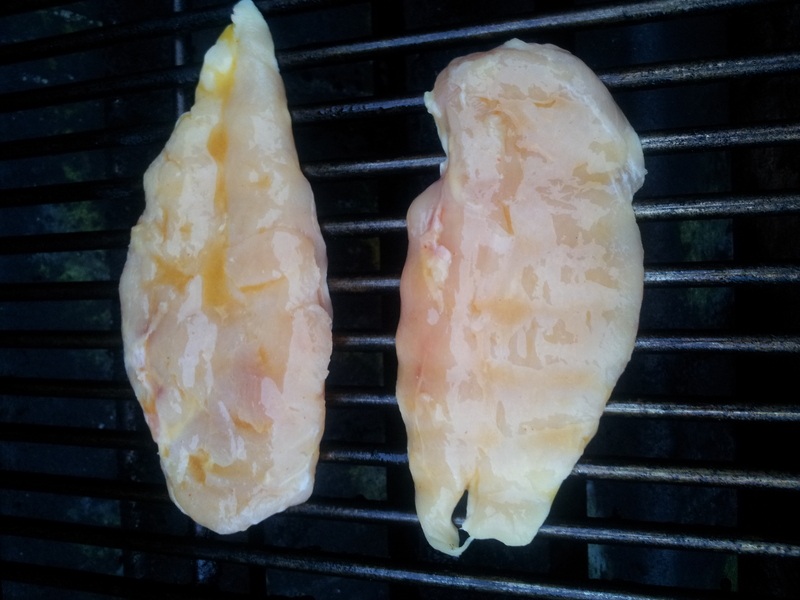 Place chicken on the grill and brush the top with your sauce. Close cover and cook 3-4 minutes. Flip and brush other side with sauce. Once you have cooked another 3-4 minutes, reduce heat to about 350. 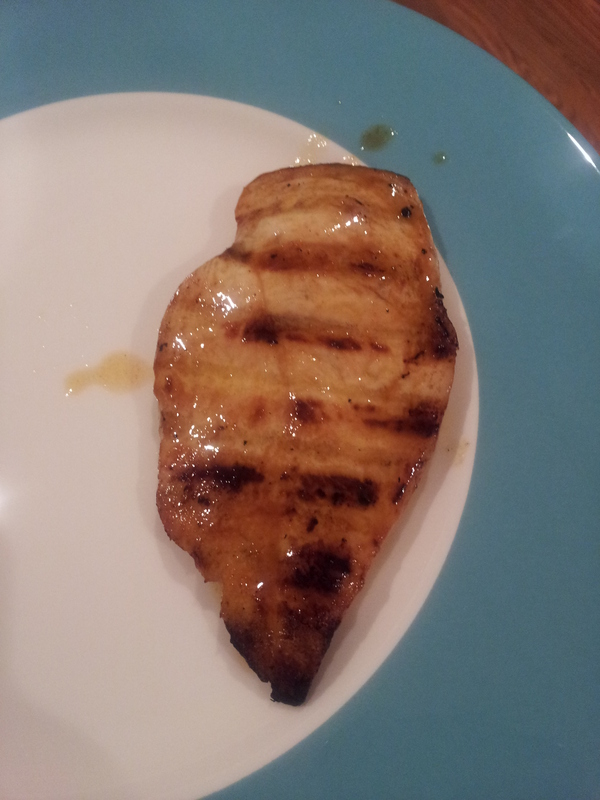 Flip chicken every 2 minutes or so, basting with the sauce. 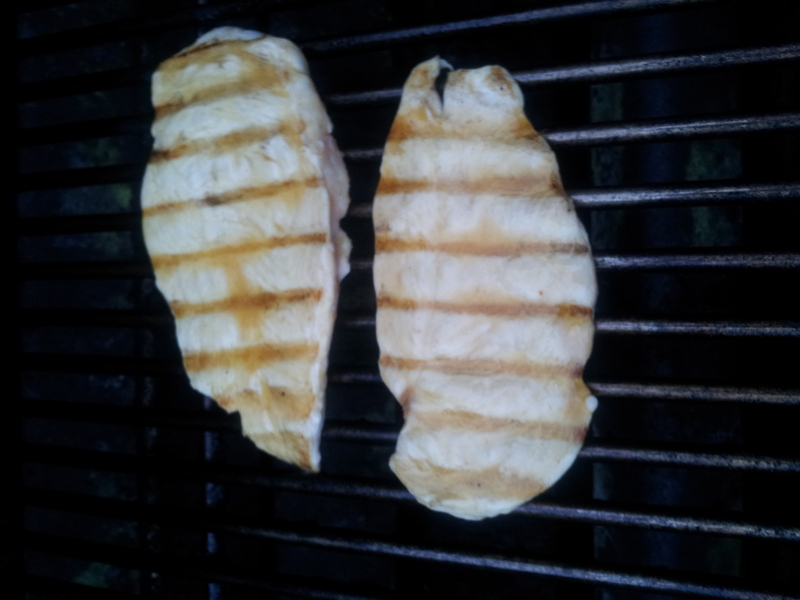 Once your chicken is cooked through and you have some nice grill marks (not char marks, mind you) you are ready to plate. 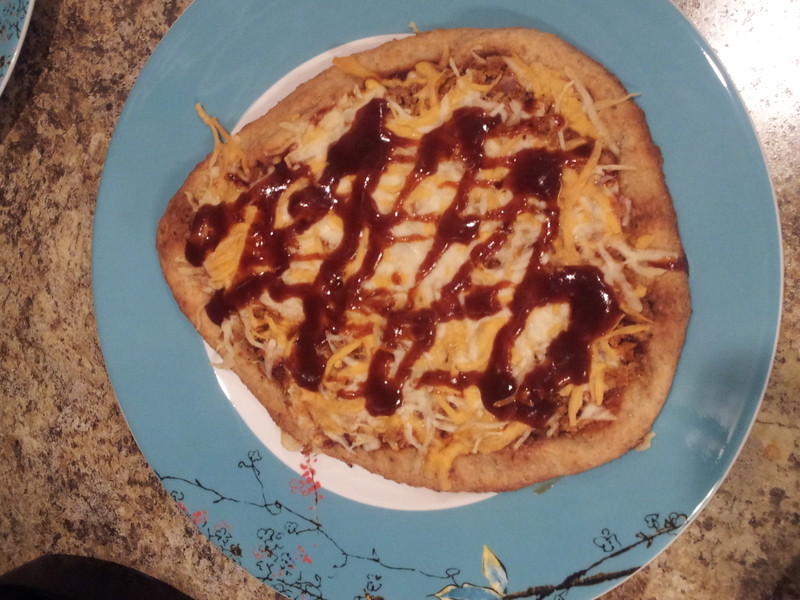 I added one last brush of sauce once it was on the plate to ensure all of the flavor was there! I feel like I did a marathon this weekend! 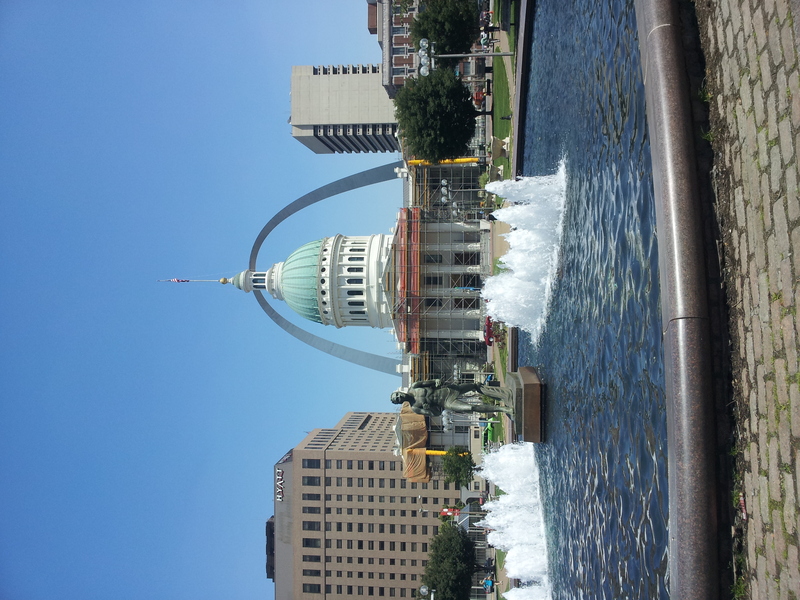 I was so fortunate to be able to drive up to St. Louis this past weekend for one of my dear friend’s bachelorette parties. 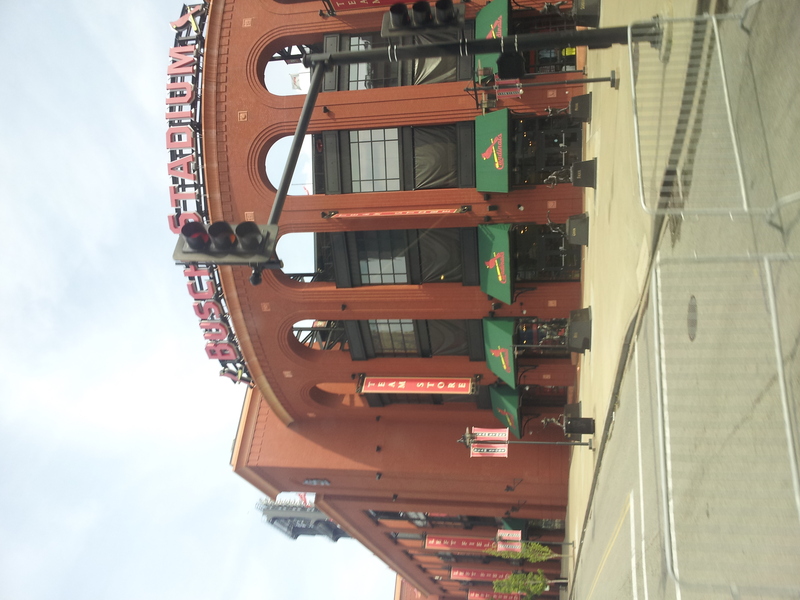 Home of the World Series Champions! Since I went to school at Penn State and live in Memphis, it’s very rare that I get to spend a weekend with my best friends from college. Like, seriously, we hail from Florida, Pennsylvania (Philadelphia and Pittsburgh both represented), Connecticut and Illinois. So getting together can be a challenge – but when we do, there is no shortage on fun – which includes choreographed dances and Beauty and the Beast sing-a-longs! More to come too – because since November, three of my girls have gotten engaged! 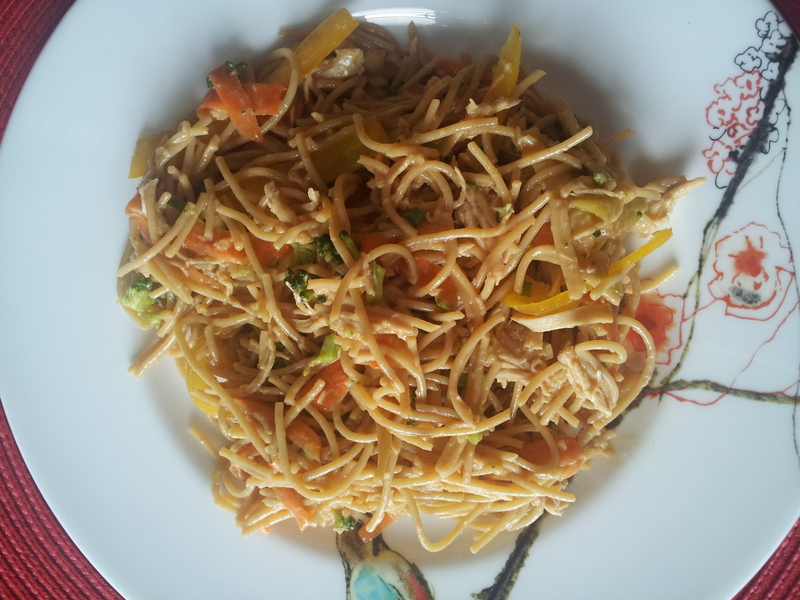 So before I had headed out on my solo road trip that involved a lot of jamming out to my favorite artist (Eric Church) – I made a delicious pasta salad-type dish with an Asian twist. 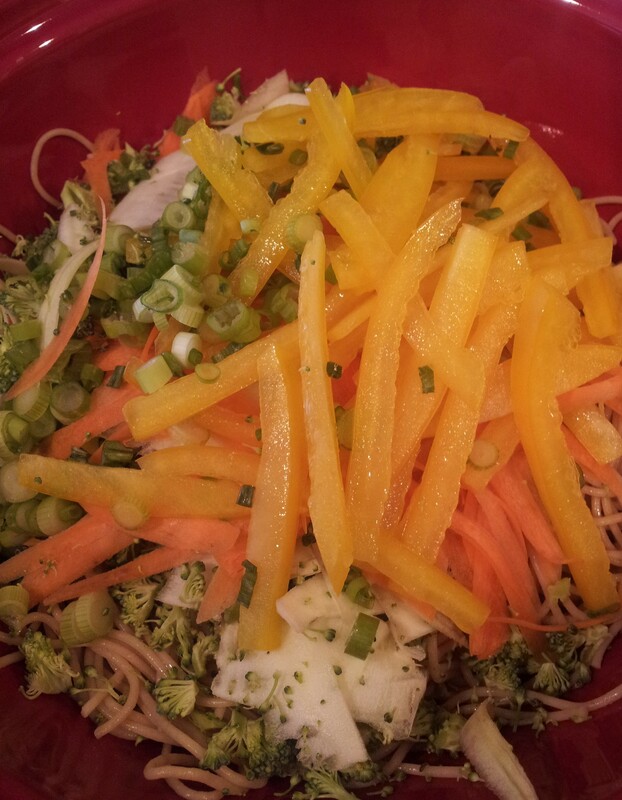 I could totally eat this for dinner, but it made up a lot of my lunches last week. And man, were my lunches good. Like, seriously. You don’t even have to wait in line for a microwave in your break room at work – because you eat it cold. And dear goodness, it is incredibly delicious. 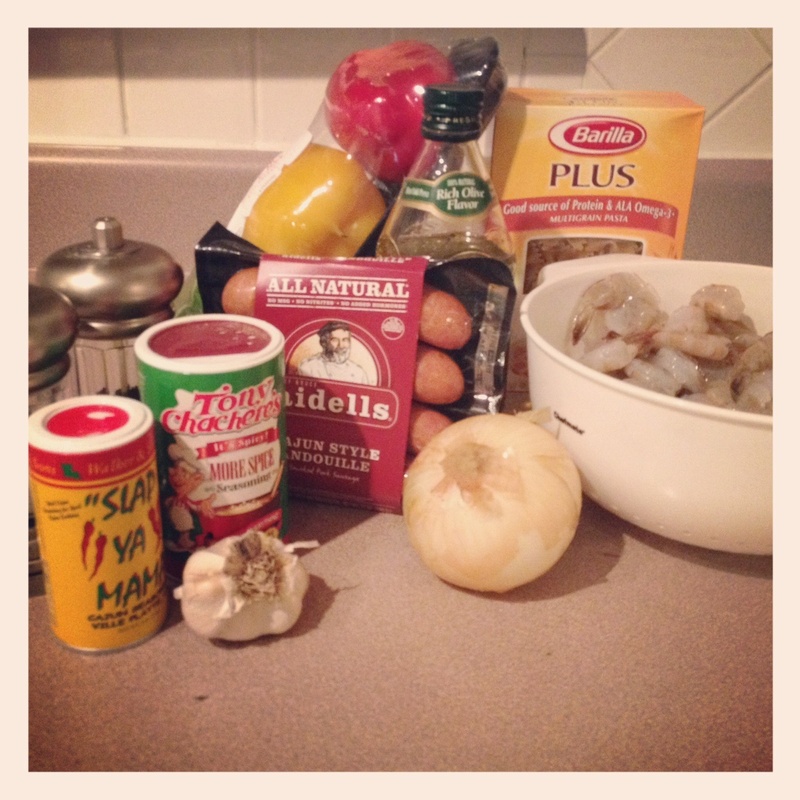 It’s a lot of ingredients – but don’t be intimidated! You won’t regret making the full recipe – or even doubling it if you are one of those people (aka me) who let produce die in your refrigerator drawers after 1-2 uses. 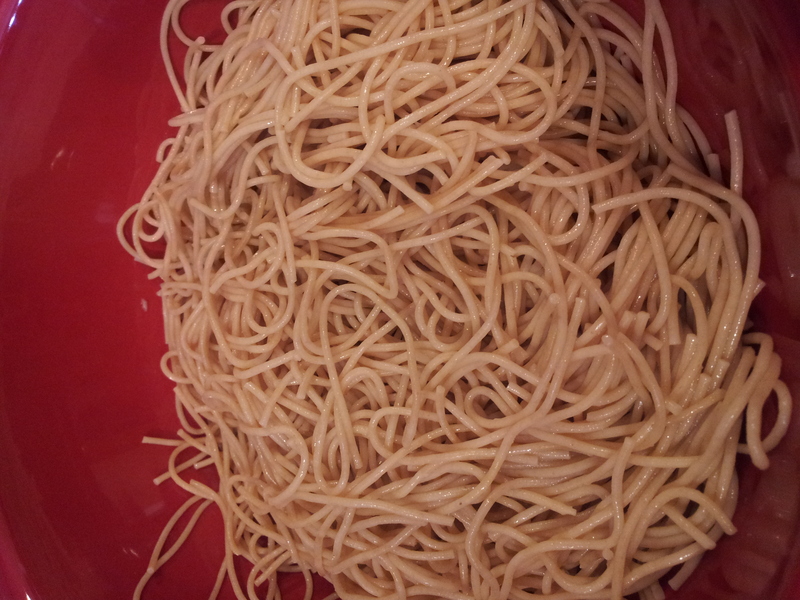 Boil pasta according to directions. 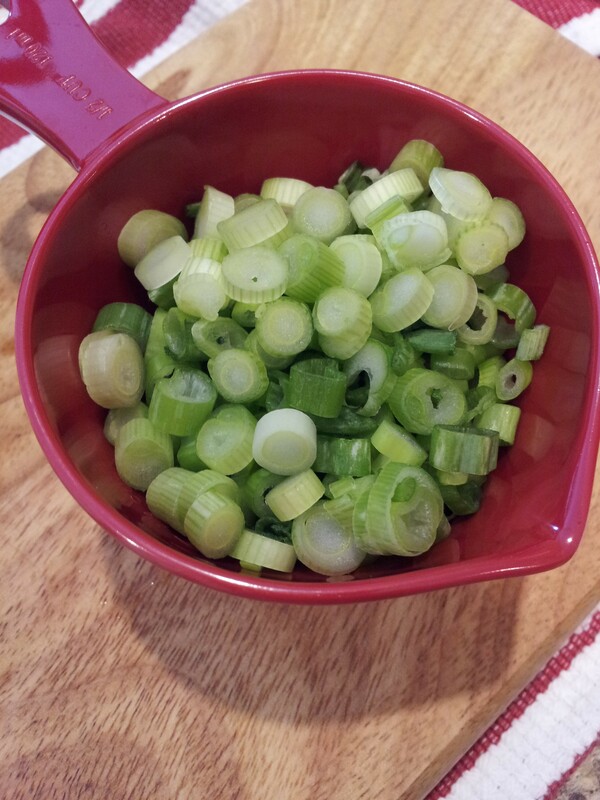 Drain, set aside and let cool in a large bowl. 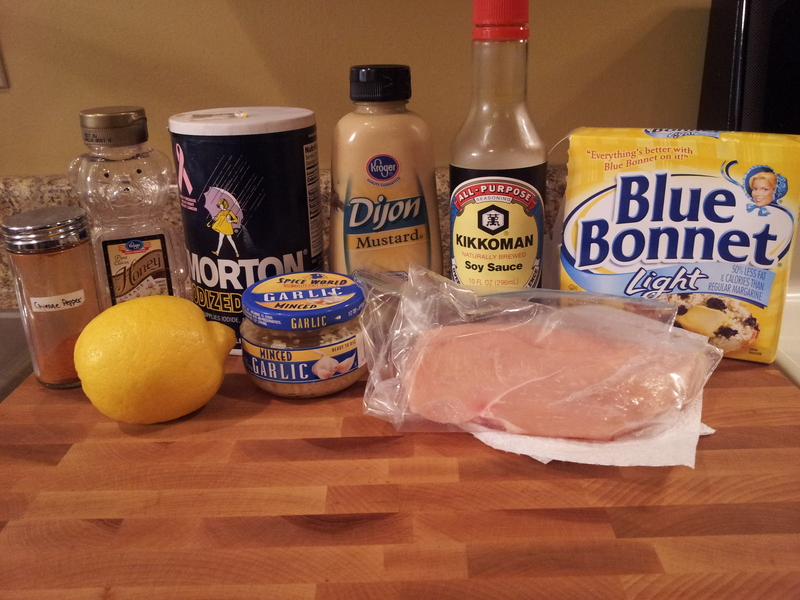 Boil chicken breast for 8-10 minutes until cooked through. Cool 3-5 minutes. Shred with two forks. 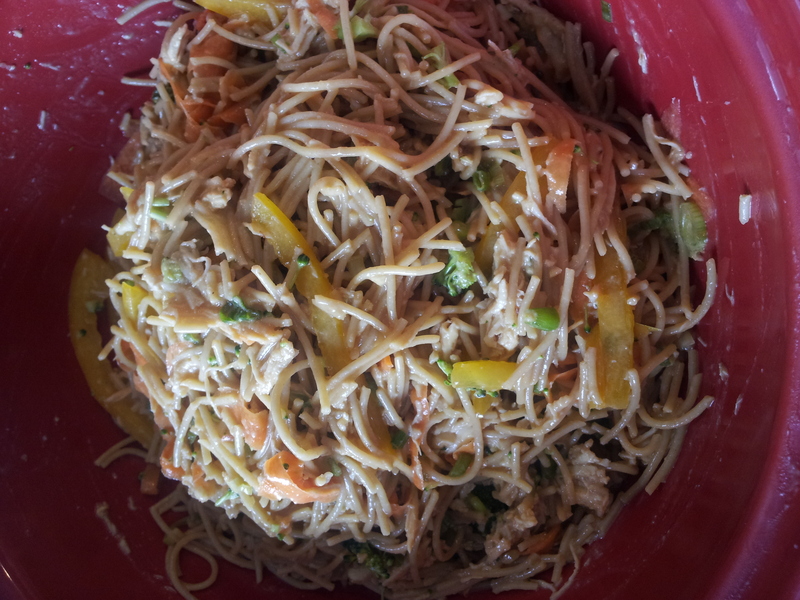 Add bell pepper, carrots, zucchini, green onions and broccoli on top of pasta. 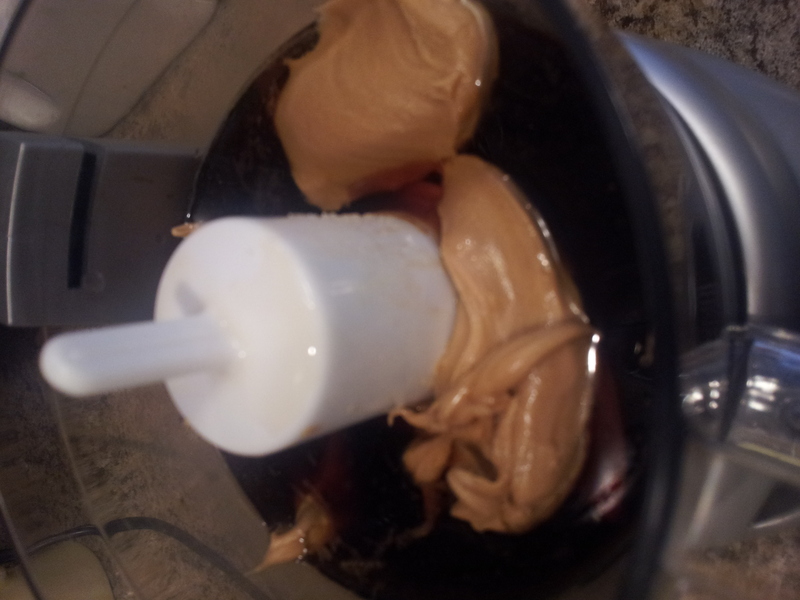 In a food processor, add soy sauce, water, peanut butter, sesame oil, rice vinegar, honey, ginger, garlic and Sriracha. Pulse until smooth. Add peanuts and pulse a few more times. 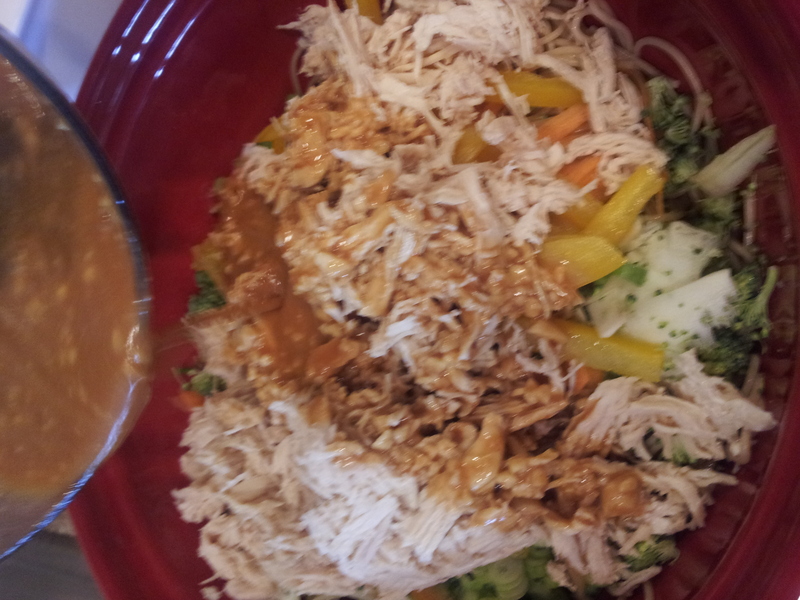 Pour dressing over chicken/veggie/noodle mixture and toss until combined. 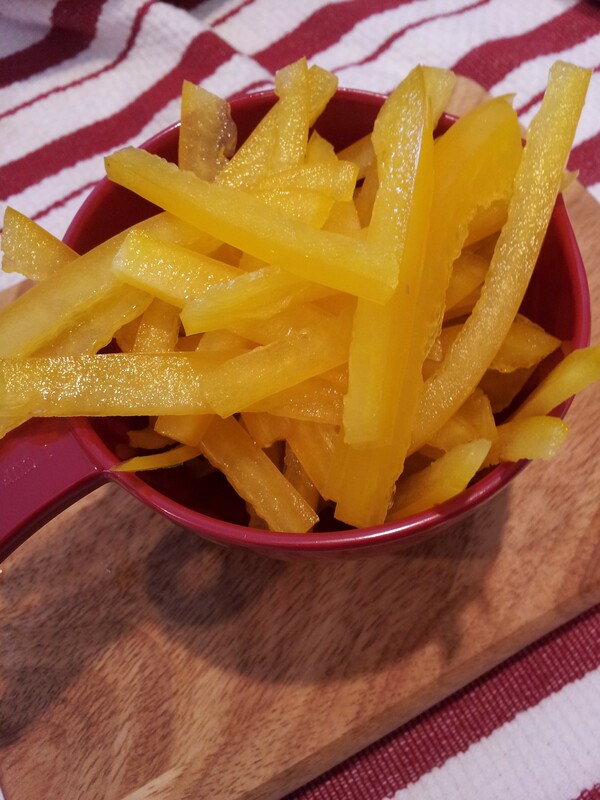 I am so excited to be the guest blogger today on Cooking on the Bright Side! Mary and I have been great friends for just over five years. We met in a senior-level college class at the University of Memphis and found commonality in our love for beer, boys, and big ten football (a great starting point for any friendship). I learned quickly how much Mary values and loves her family and that’s something I really admire about her. We shared our love for family and food one evening when my mom was in Memphis visiting. Mary invited my mom and I over for dinner with her and her dad. We enjoyed a beautiful meal. We drank wine and laughed, we drank more wine and cried and by the end of the night I left with this incredible sense that I had found a friend for life. That time around the dinner table was so important to our friendship and its a memory that I’ll carry with me forever. Cook the pasta according to package instructions, then drain and set aside. 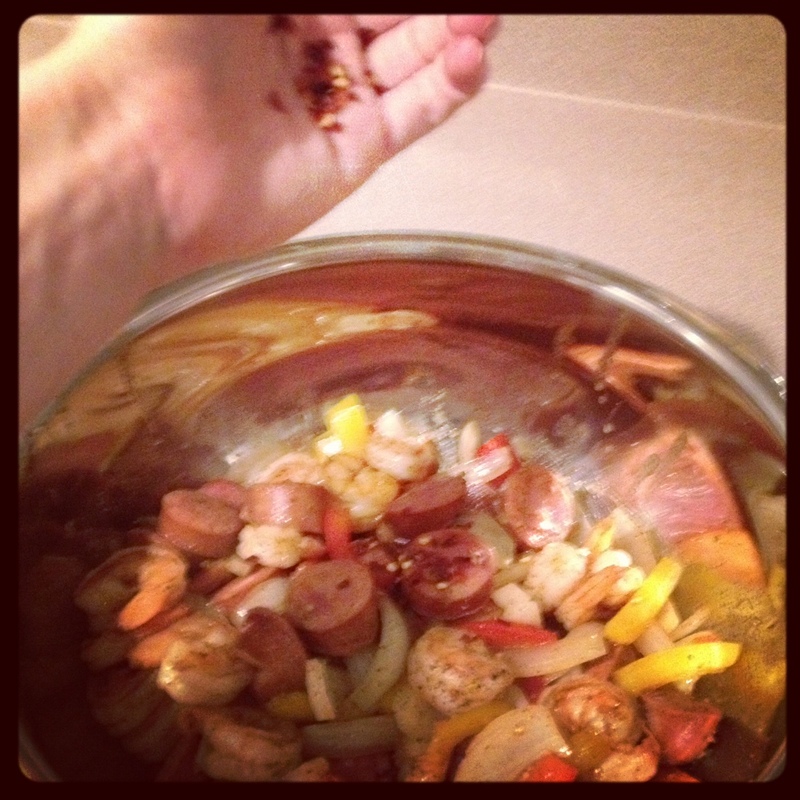 Place shrimp in a large bowl and sprinkle with 1 tablespoon of theSlap Ya Mama Cajun Seasoning. Stir so that the shrimp is well coated, set aside. 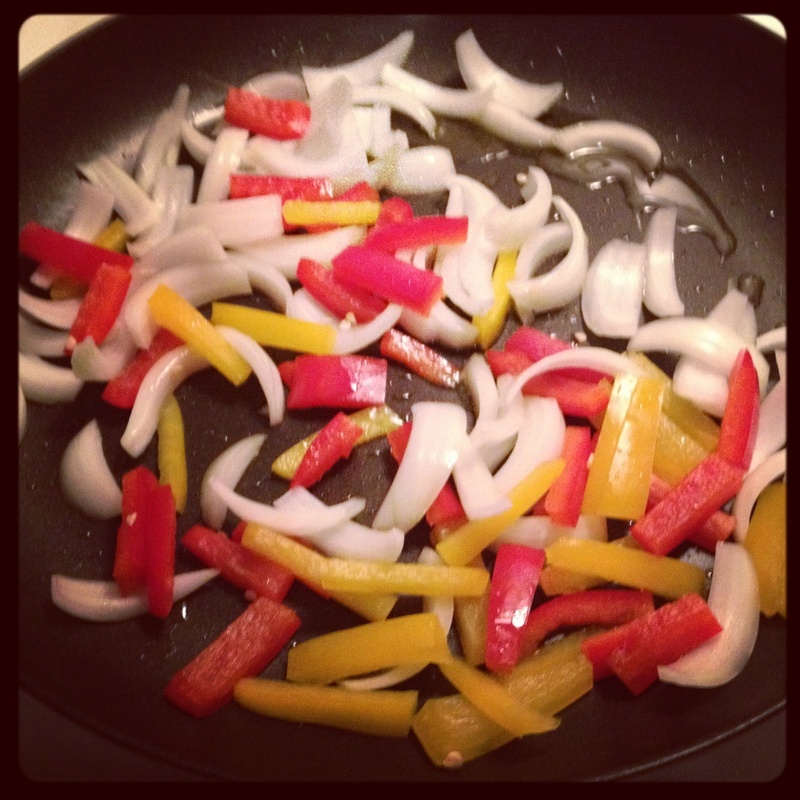 Heat 1 1/2 teaspoons of olive oil in a large skillet over medium high heat add peppers and onions. 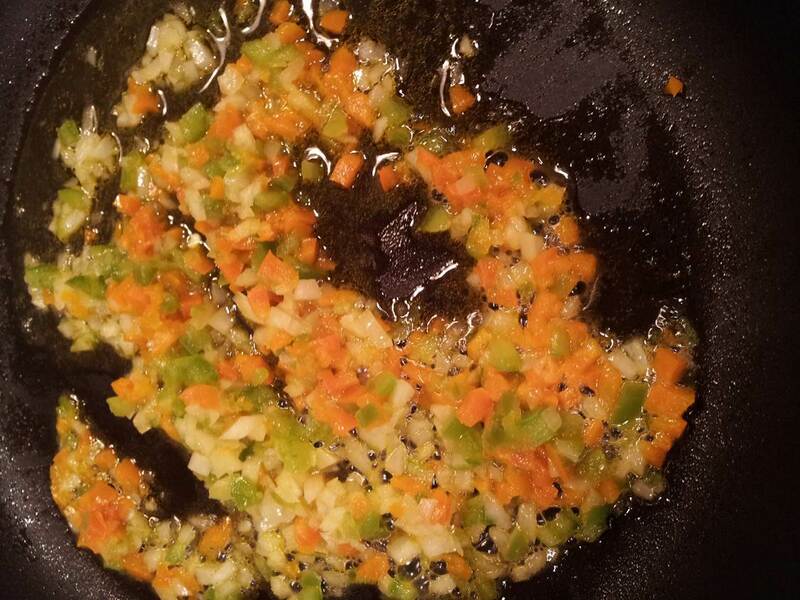 Saute the vegetables for 2-3 minutes. 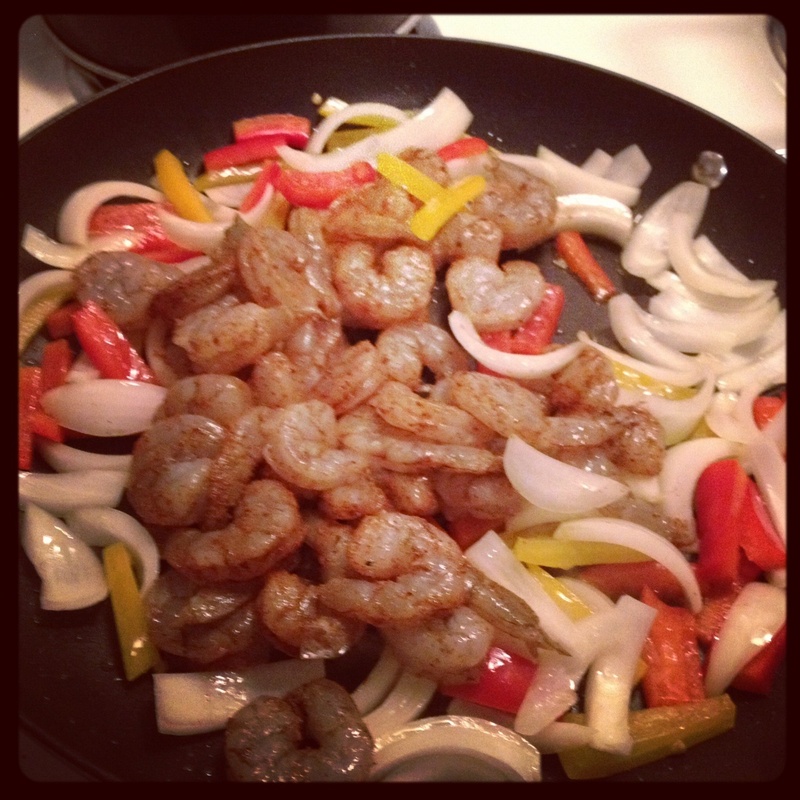 Add an additional 1 tablespoon of the oil to the skillet and add shrimp to the vegetable mixture. 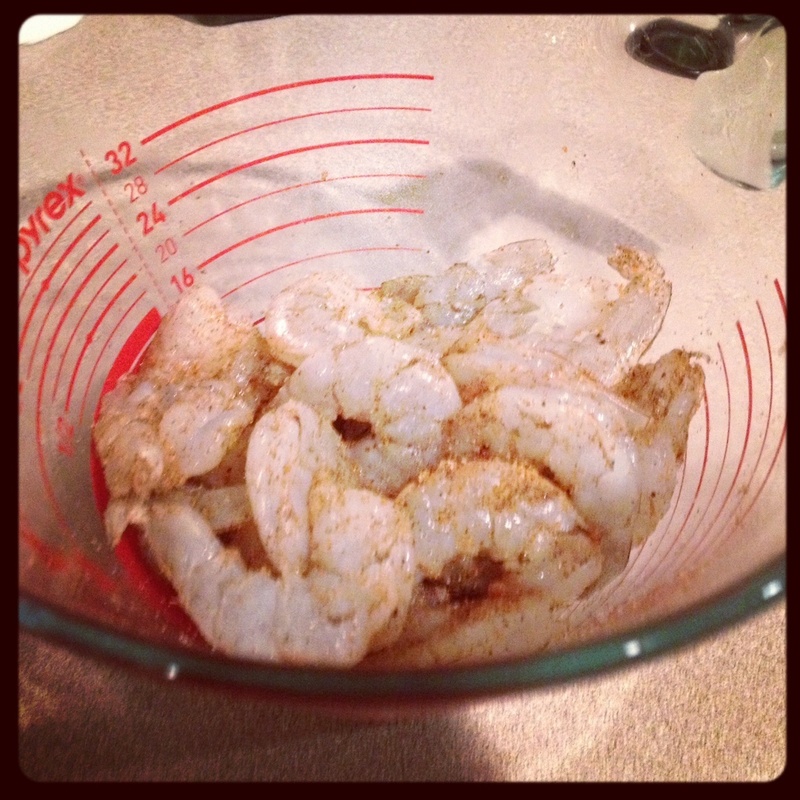 Cook the shrimp for about 3-4 minutes or until theshrimp turns pink and is fully cooked. 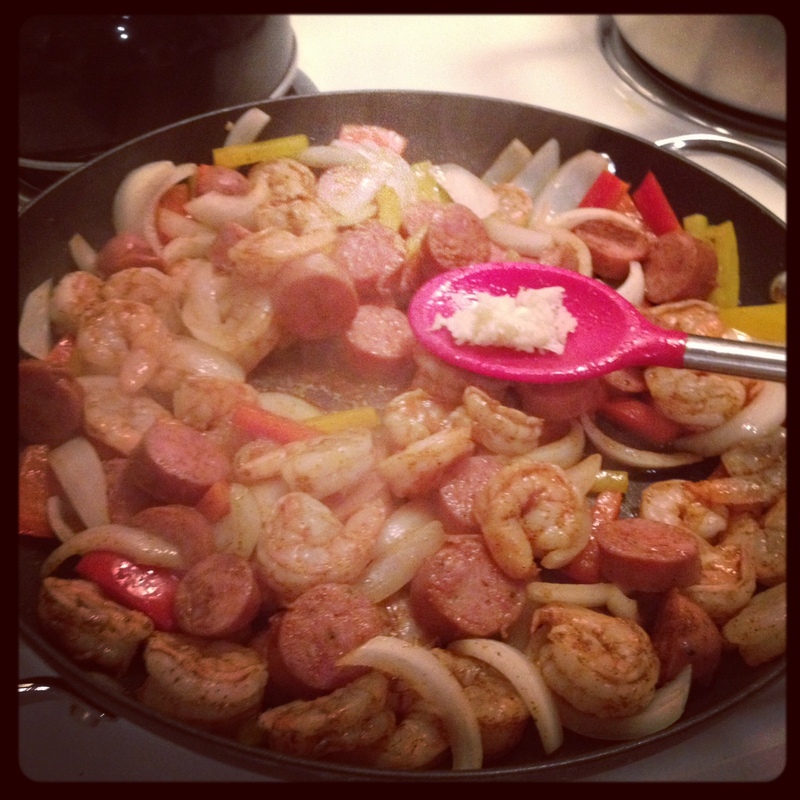 Similar to the shrimp, use the remaining 1 tablespoon of Slap YaMama Cajun Seasoning to coat the andouille sausage. 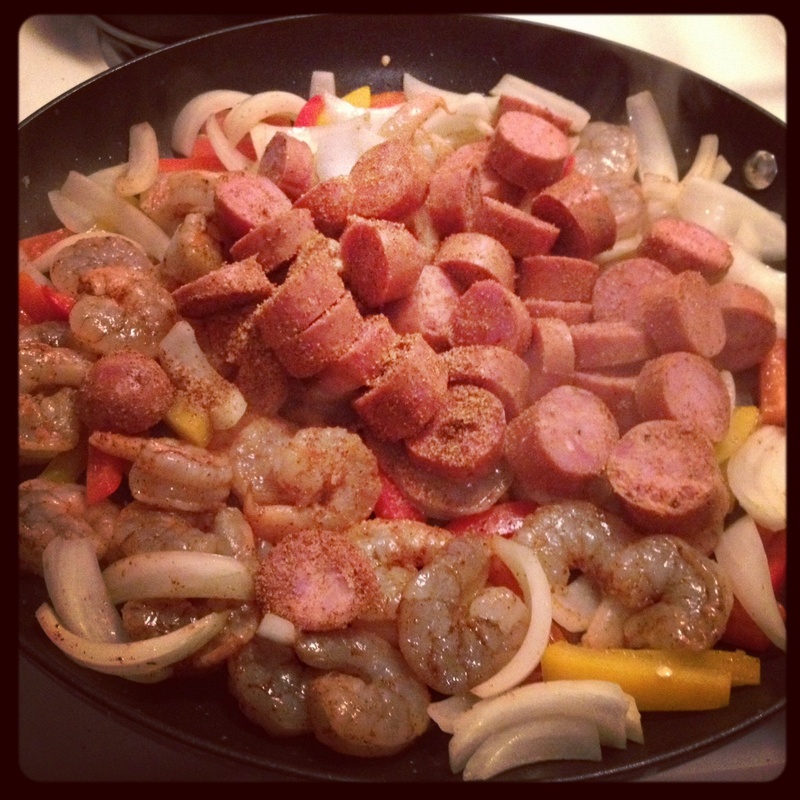 Add the remaining oil to the skillet if necessary and cook theandouille sausage in with the shrimp and vegetable mixture for about 3 minutes or until sausage is fully cooked. Stir in the garlic and cook an additional minute. 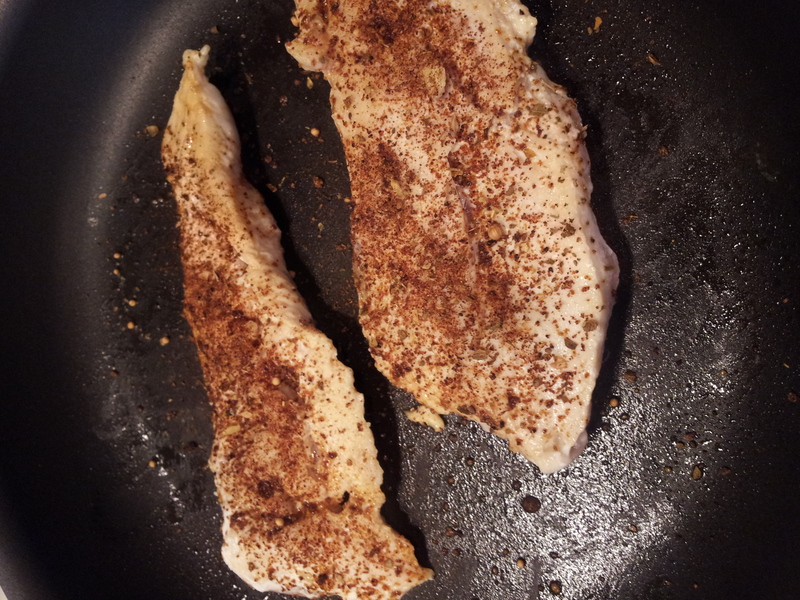 If you’d like to add a little heat stir in some crushed red pepper (to taste). 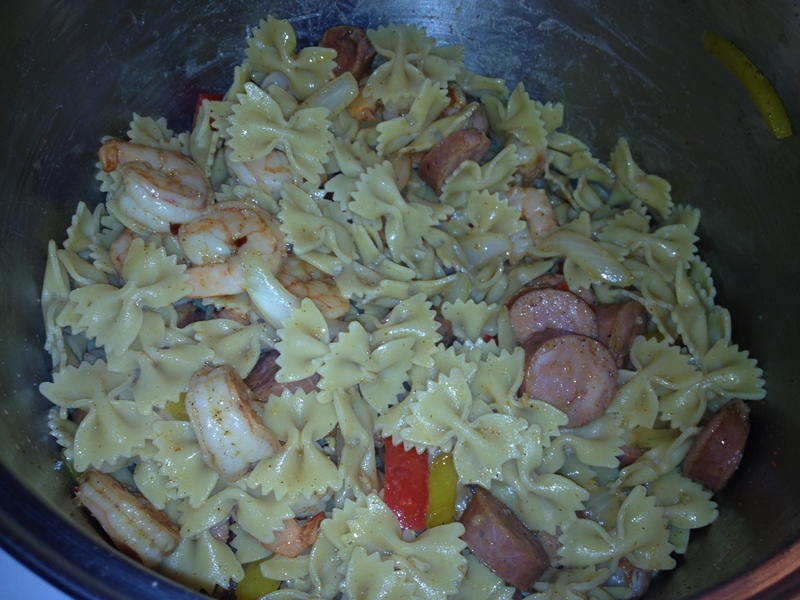 In a large pot combine the pasta and the entire shrimp and sausage mixture. Sit at a dinner table with someone you love and enjoy. T.G.I.F. people! And welcome the return of some faux-bar food Friday deliciousness! 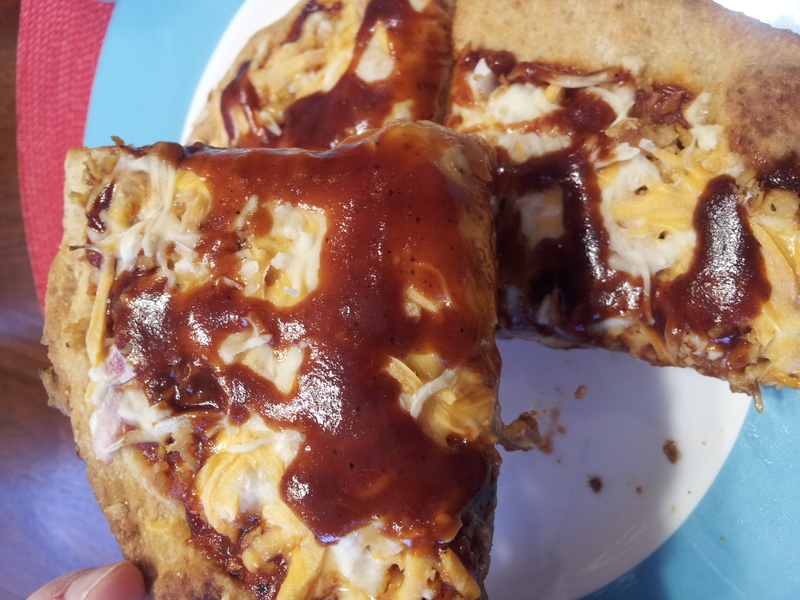 Now, you know the husband and I love our homemade pizza creations – but sometimes, there’s just not enough time to make the dough and let it rise in time for dinner! So on those evenings, I usually stop by the store and grab a 2-pack of Naan – which is an Indian flat bread. 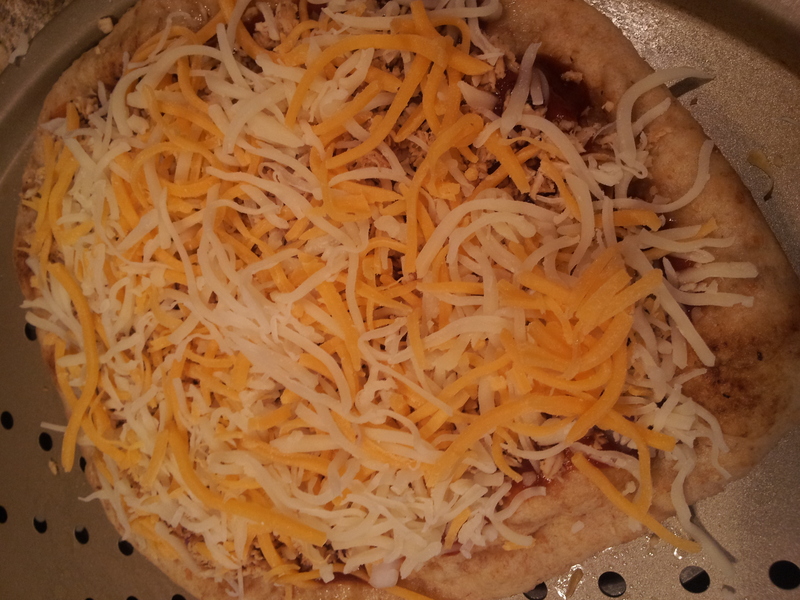 You can also grab a pre-made pizza crust. 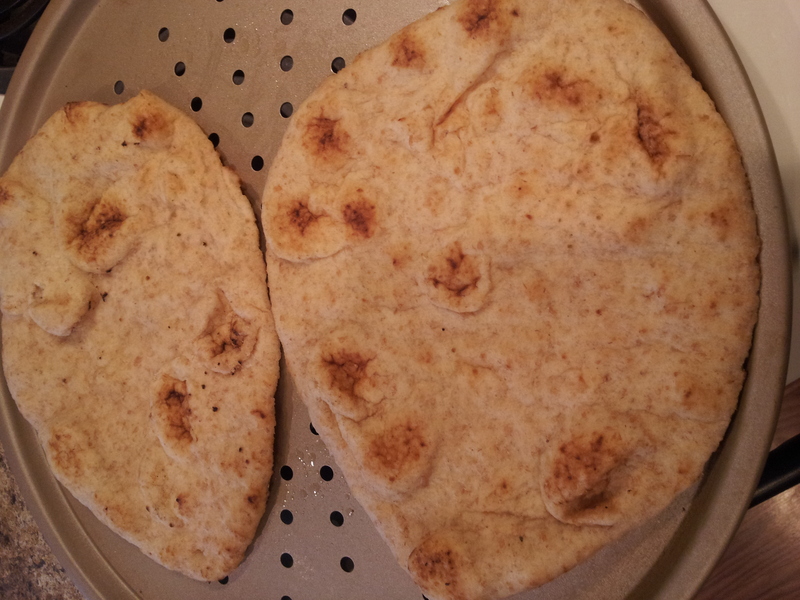 I just love the “rustic” shape of flat breads. And my co-workers can testify that any time we go out to lunch, if there’s a flat bread on the menu, I will be ordering it! You can obviously throw anything on this and make it your own, but here is a variety that we love! Try it this weekend – there’s so much going on this Saturday (Grizzlies playoff game, Kentucky Derby, Cinco de Mayo celebrations!) 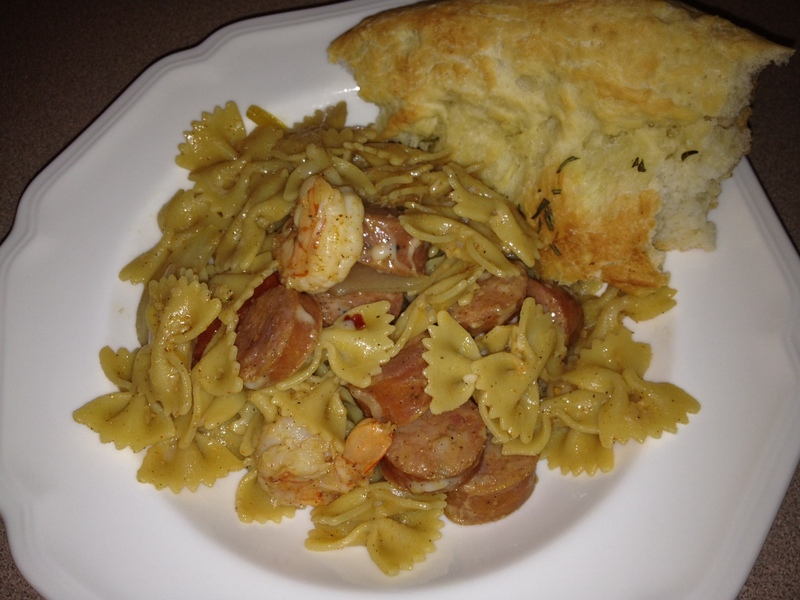 so this might be a great meal to throw together between gatherings and parties! Heat a skillet on medium. 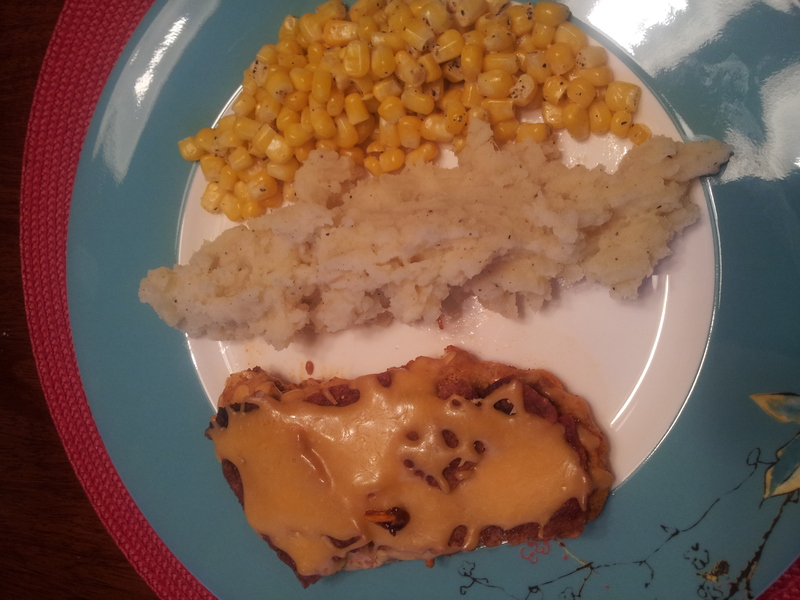 Coat chicken breasts on both sides with barbecue seasoning. 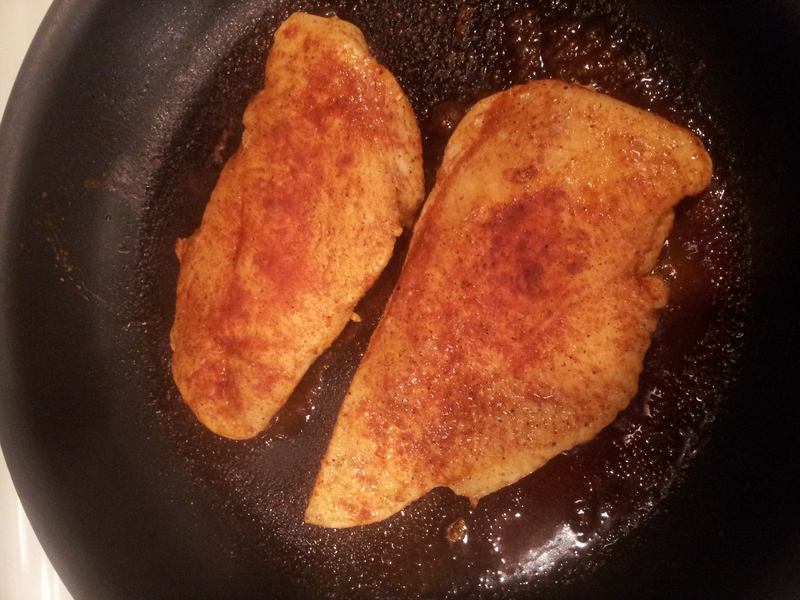 Cook chicken in skillet. 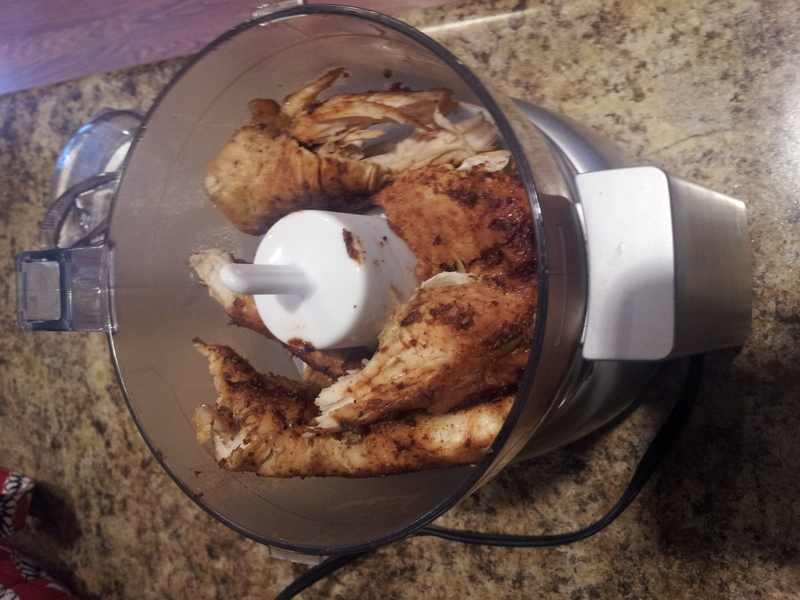 Once chicken is cooked, add to food processor and shred. 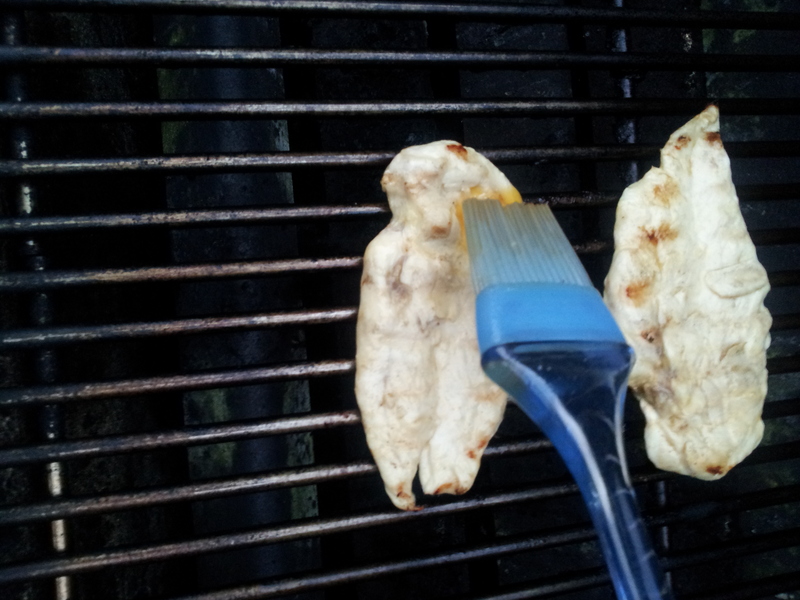 Spray Naan with olive oil and sprinkle garlic salt. 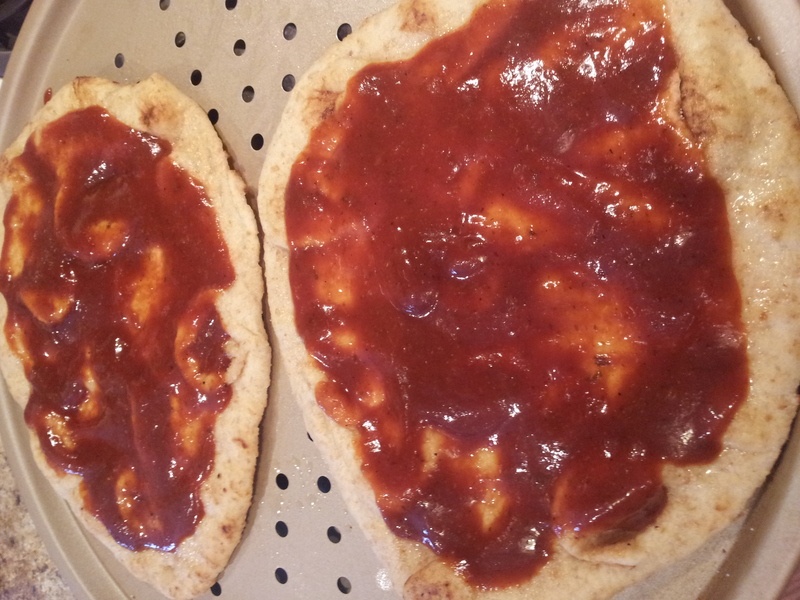 Pour barbecue sauce over Naan and spread. 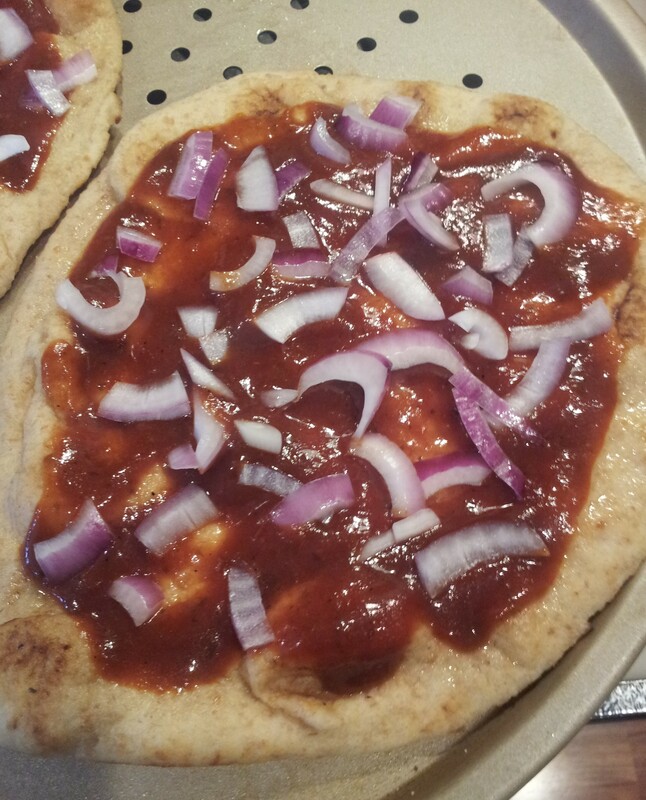 Add red onions on top of the barbecue sauce. 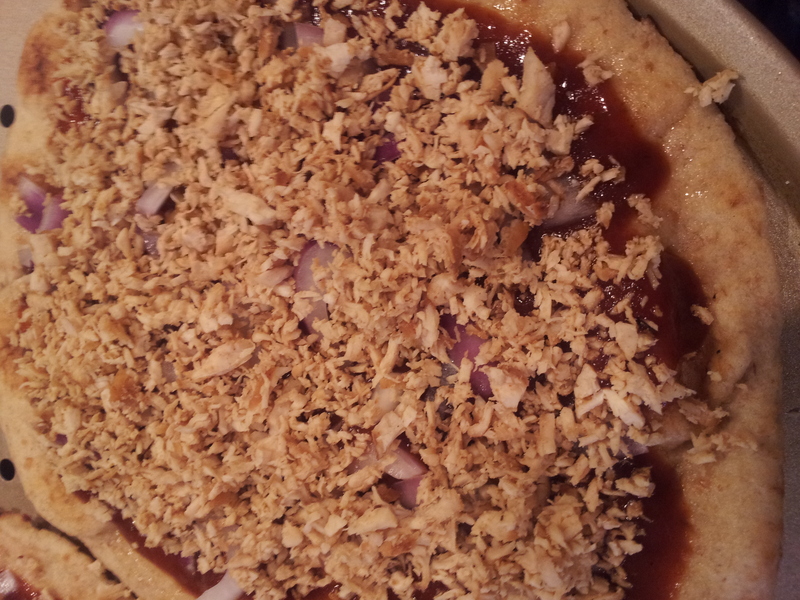 Add shredded chicken on top of the onions. 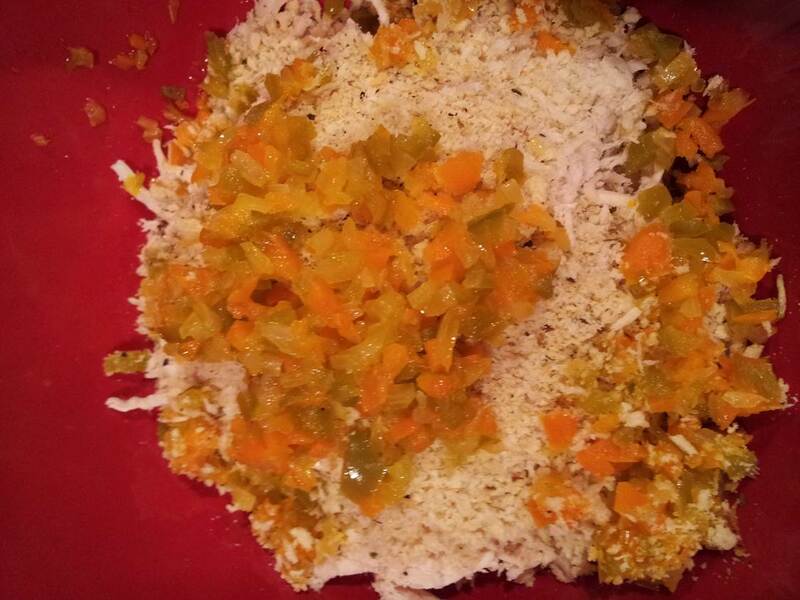 Mix cheeses together and sprinkle on top of the chicken. 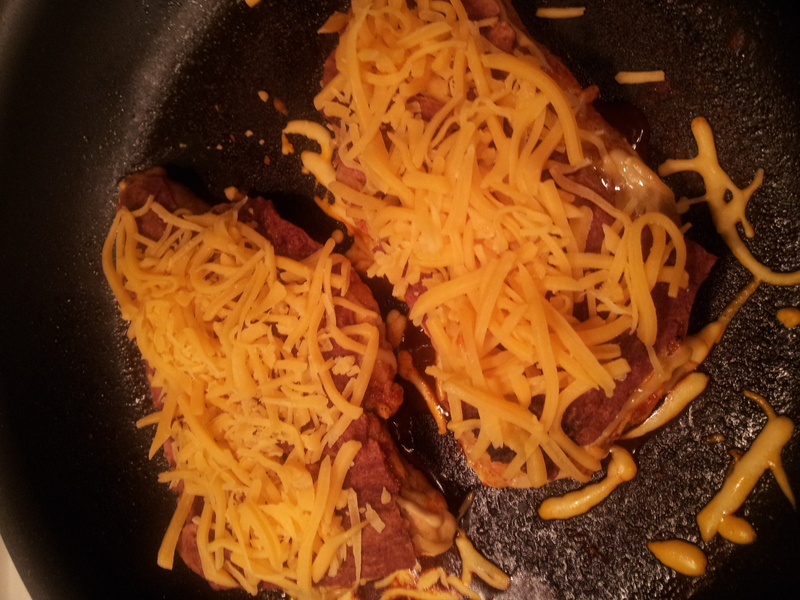 Bake for 12-15 minutes until crispy and cheese is melted. 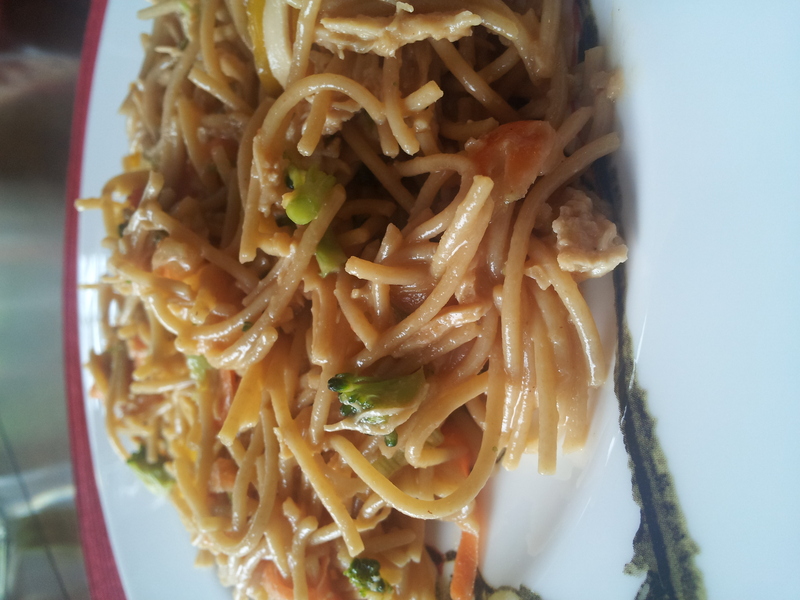 Drizzle with additional sauce and serve! Slice and wash down with a cold beer. 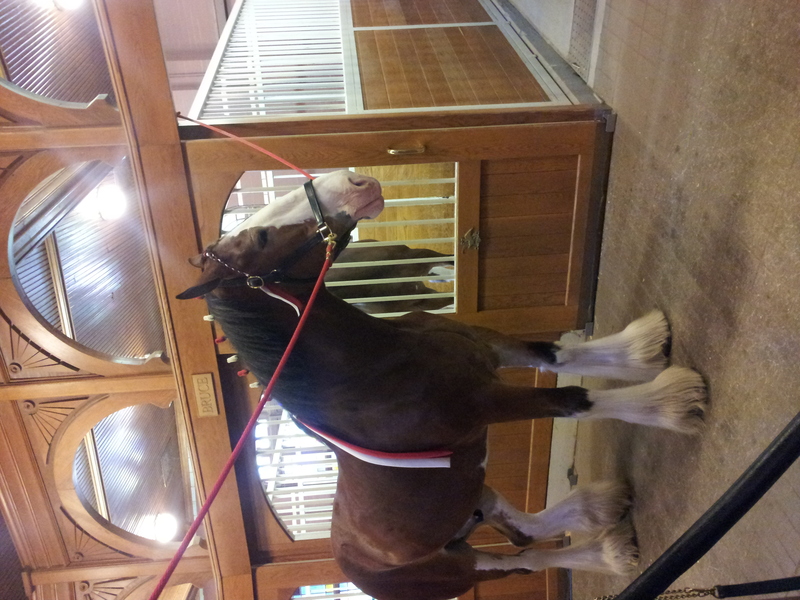 Or mint julep. Or margarita. Like I said, it’s a big weekend! Oh – and Happy Star Wars Day – May the 4th be with you! So it’s the beginning of the month aaaand I am in desperate need of a grocery run. 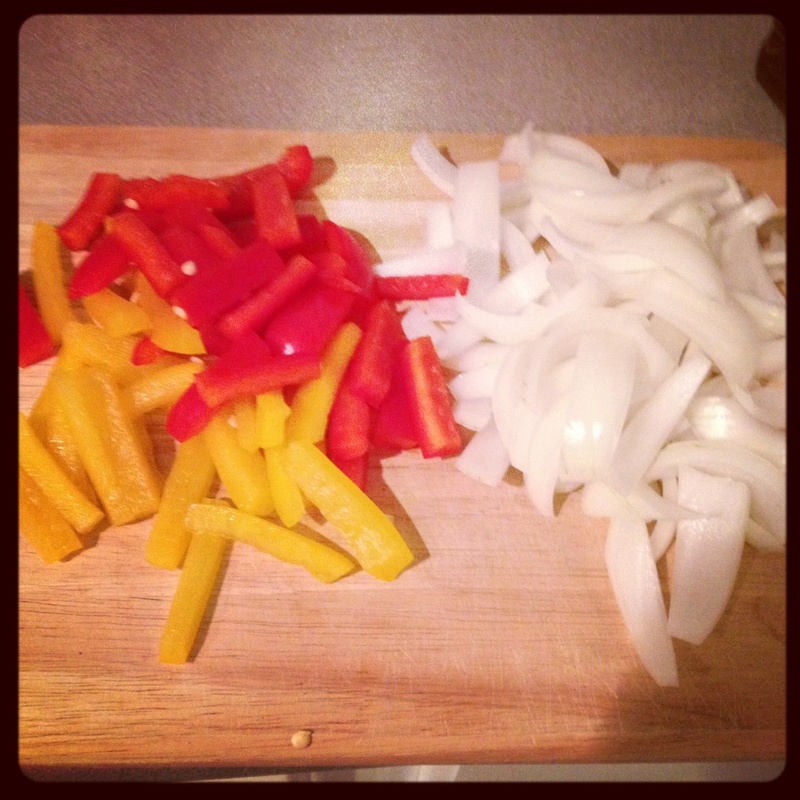 But the playoffs are on tonight – so I needed to get home and cook something quick! I had some chicken and was trying to think of something new to do with it. But my brain is fried – so I really couldn’t come up with anything. I was ready to just do the good old standby of Georgia Baked Chicken. But when I opened the fridge, I saw cheese. And bacon. So why not throw those on top of some chicken? Yes, I know what you’re thinking. Evil. Genius. Heat a medium skillet to medium. 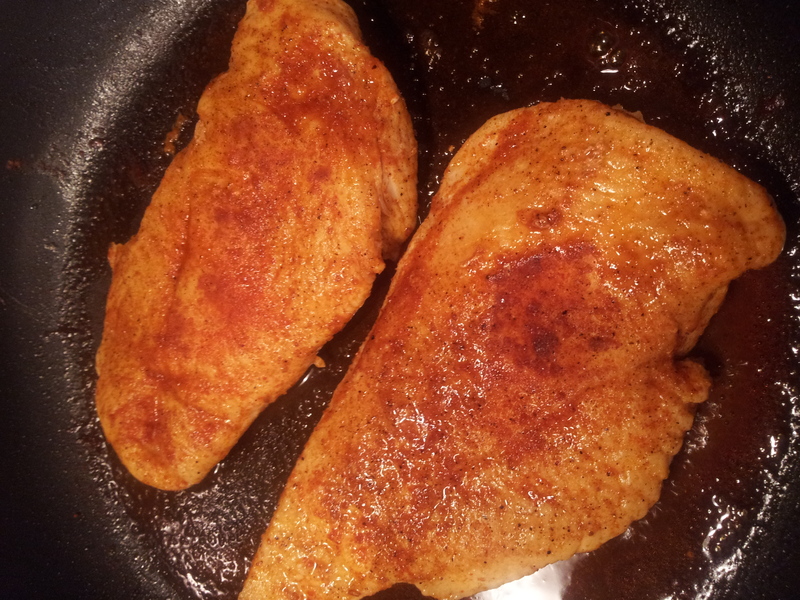 Sprinkle both sides of chicken with paprika. 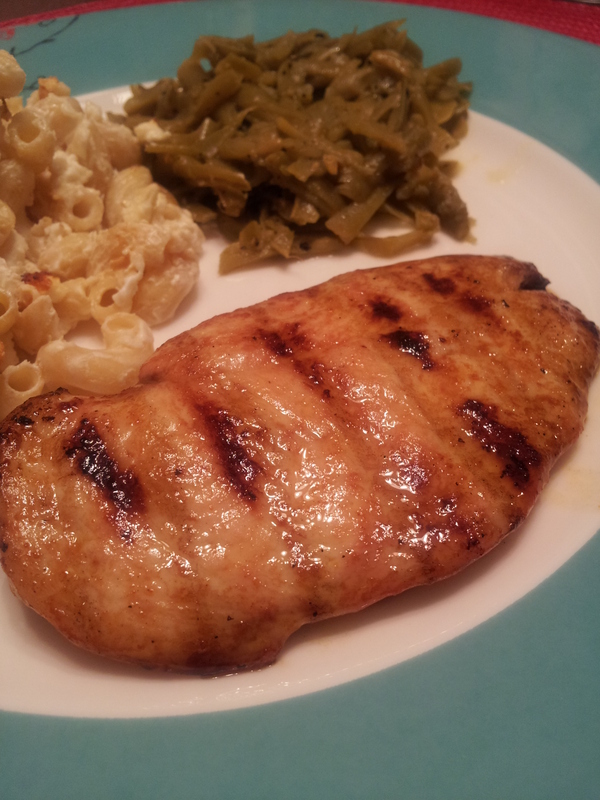 Cook chicken in skilled for 4-5 minutes on each side until lightly browned on each side. Add chicken broth to pan to keep chicken from drying out and cook another 5-7 minutes, flipping chicken once. 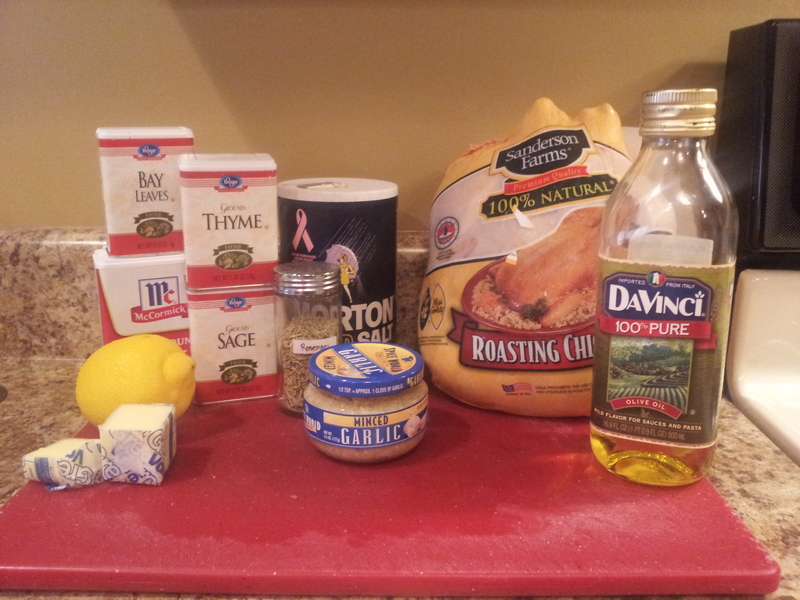 Once chicken is cooked through, spread 1 tsp. 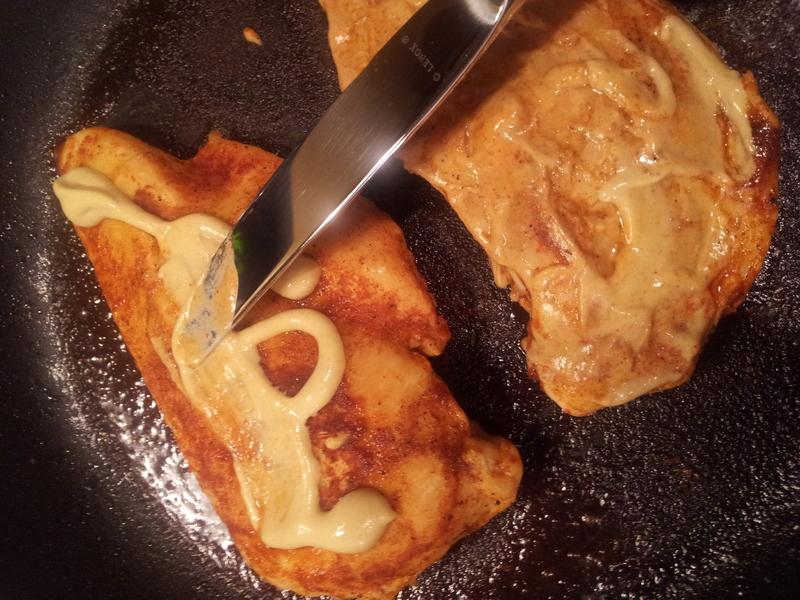 Dijon mustard on tops of each. 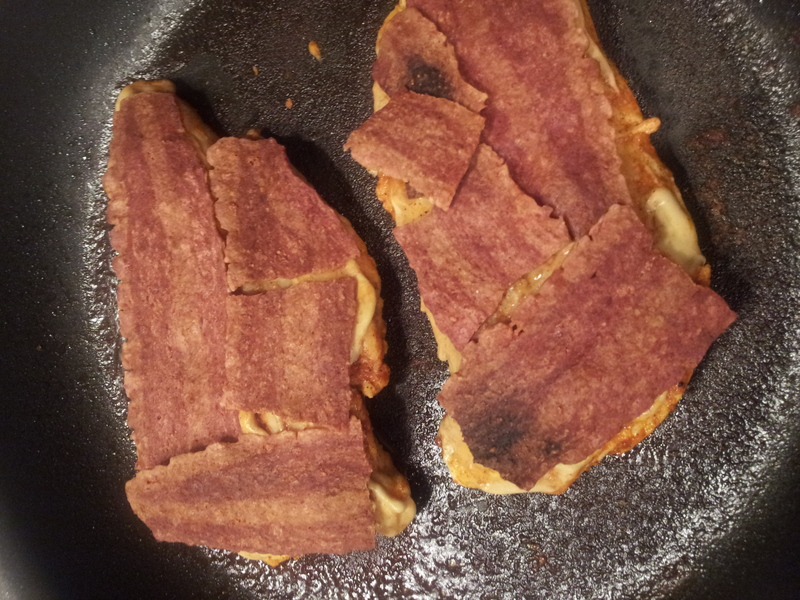 Then, break apart pieces of bacon to coat the top of the chicken. Top the bacon with cheese. Cover the skillet and turn heat to low. 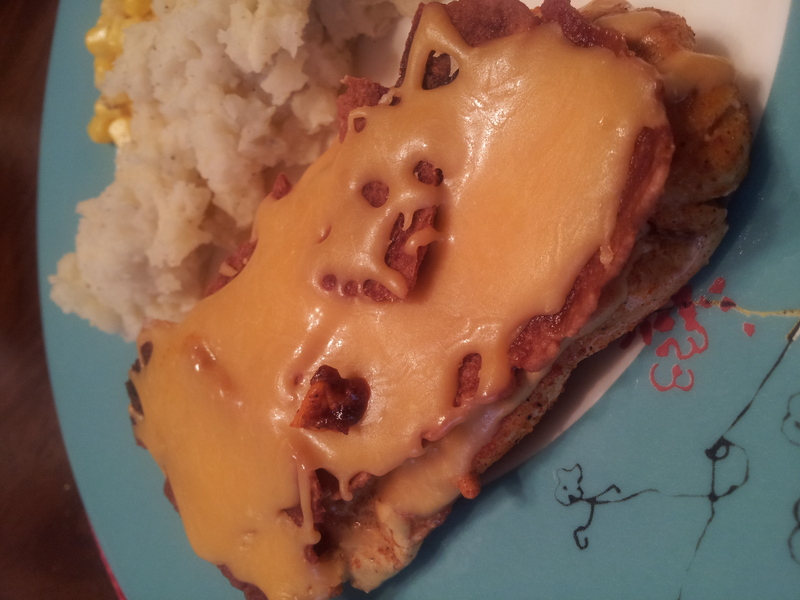 Once cheese has melted, you’re ready to serve. This was just a quick dish to throw together – and it’s also healthy too. 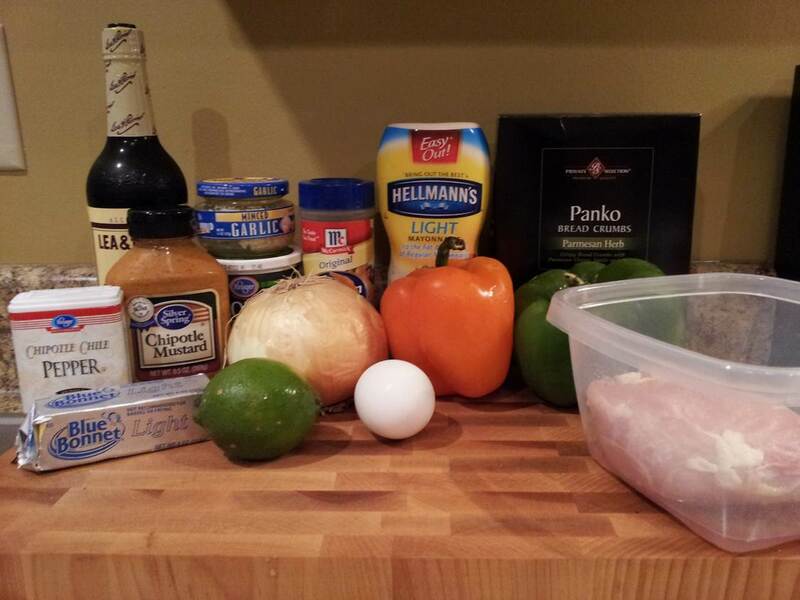 If you use the ingredients as stated above, we’re talking 5 WW points for a chicken breast. I have been a bad, bad blogger. I am so sorry that my last post was what, a week ago? Last week I came down with something awful and was at home sick for 2 days. No fun. I had to have my finger pricked – and I absolutely hate all shapes and forms of needles. The nurse asked if my blood pressure was usually low, because where mine was – apparently people are about to pass out. It’s not the sight of blood I promise – it’s more the foreign object drawing it out of me. Ummm, I bet you really want to see pictures of food right now huh? Anyways, I apologize for being a bad blogger. Saturday I was feeling much better – enough to go see “The Hunger Games” with the husband. Love. I’m ready for the second movie like, now. Sunday I was feeling SO much better that I was told to decided to do some much-needed yard work! Our incredibly mild fall/winter had a bunch of leaves falling quite late, meaning it was way too cold to get out there and scoop the remainder of them up. Well, no excuses anymore. And I have the sore muscles and sunburn to prove it. I even got a funny sunburn – I blame my pants being too large (hey, I told you the stuff I cook for you is usually good for you, right?) so bending down and scooping up leaves allowed me to get a glorious sunburn on my lower back. Yes, these kinds of random things happen to me. ANYWAYS – Friday night, I was trying to figure out some meal plans for the remainder of the month that would fit our grocery budget and realized I had a whole frozen chicken hanging out in the freezer since like, before our wedding. So I decided that would be dinner on Sunday. It’s frozen, so the expiration date which had passed didn’t really mean anything…right? 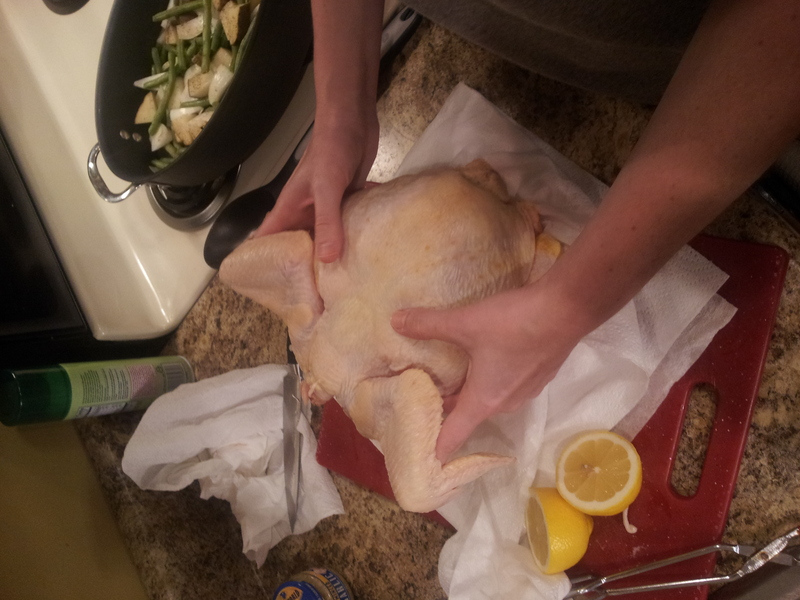 So I was a bit intimidated by this 5 1/2 pound chicken. But guess what. There was no reason to be! (Other than learning that next time I will try to find a chicken with the “innards” bagged up and stuffed inside rather than “going fishing”.) It really was quite easy and for just two of us, it made a LOT! So pick up a chicken, don’t wait for a year to roast it, and enjoy! Heat your oven to about 425 degrees. 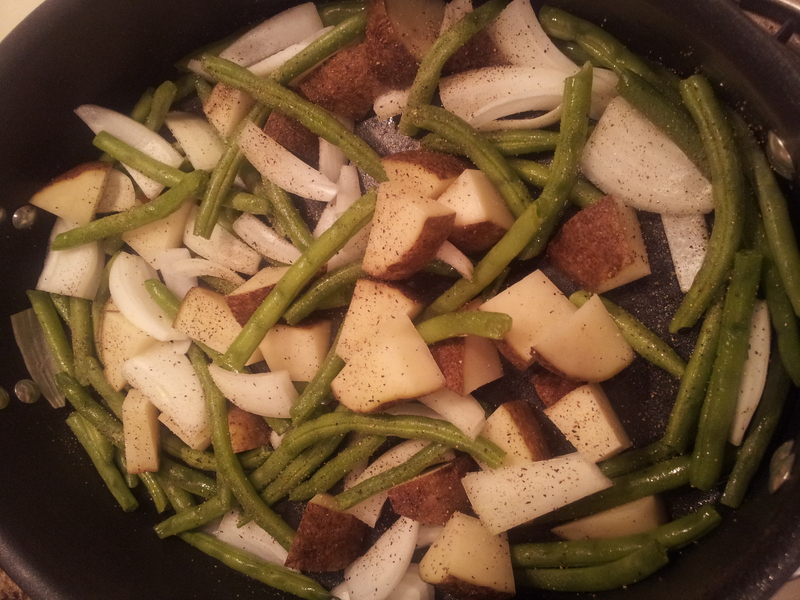 I had about 1/2 pound of green snap beans, so I decided to use those, half an onion and 1 russet potato to make a complete meal in 1 dish. 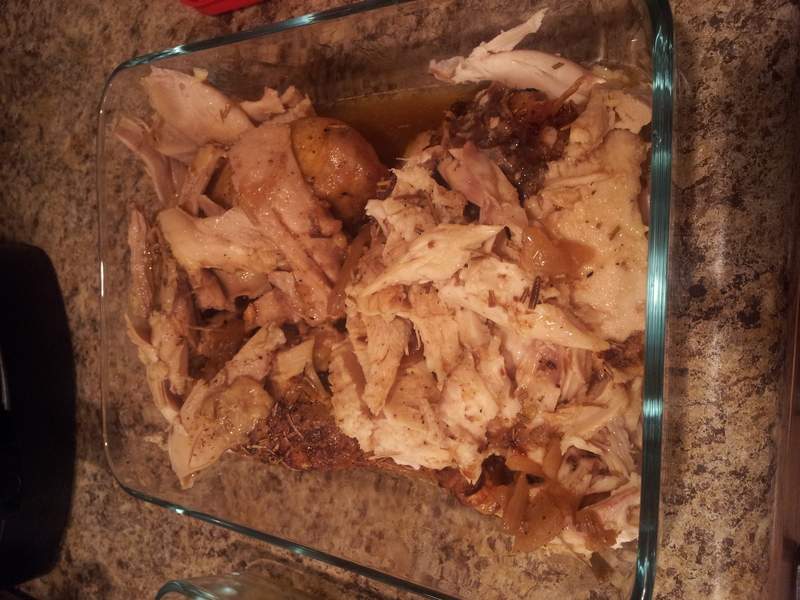 I chopped it all up, seasoned it with salt and pepper, and threw it in the bottom of a medium roasting pan. Feel free to do the same, modify, or leave this step out completely. Next, open all of your spice containers (I would have LOVED to use fresh herbs, but I didn’t have any on hand – still tasted great) and pour some spices into prep bowls so you don’t get raw chicken over everything. I found myself juggling and using my teeth to open things. I blame the antibiotics for my lapse in judgment. Run your whole chicken under cold water and rinse well. Get inside the cavity too. Drain what you can. Remove the “innards” – again, next time I will look to see if there are some that have this step done and have it all in a nice neat little bag to pull out. Pat dry with paper towels. Lots of paper towels. Seriously. Sprinkle the inside of the cavity with kosher salt, black pepper, sage and thyme. 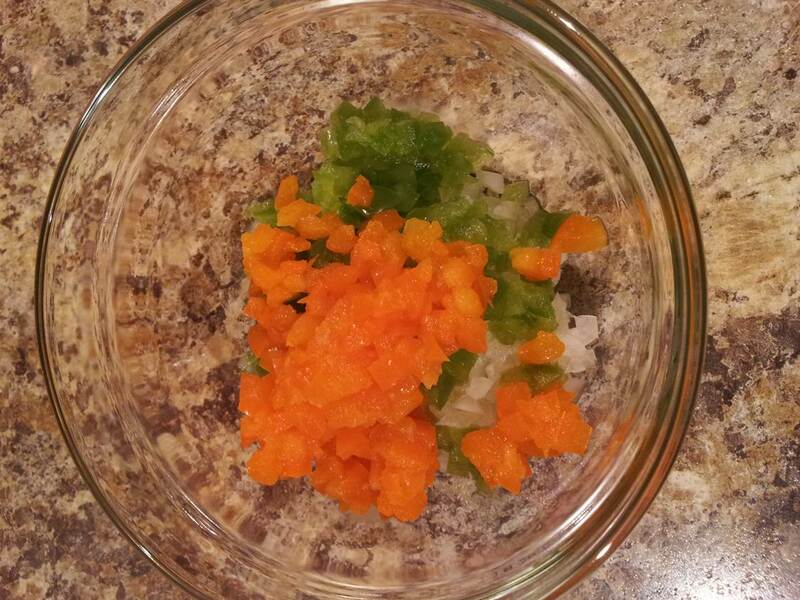 Add some garlic and spread around with your fingers. Cut a lemon or two in half and shove those up there as well. The chicken will forgive you. 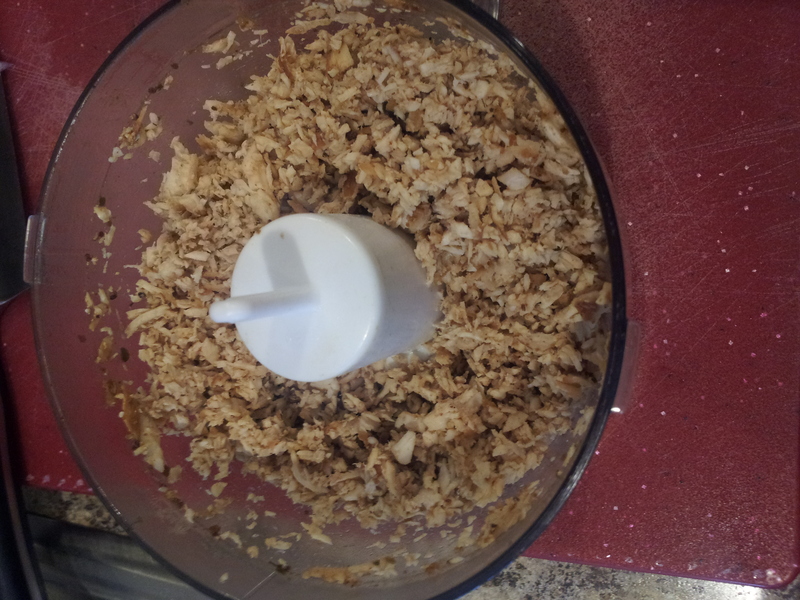 Now, drizzle about 1 tsp. 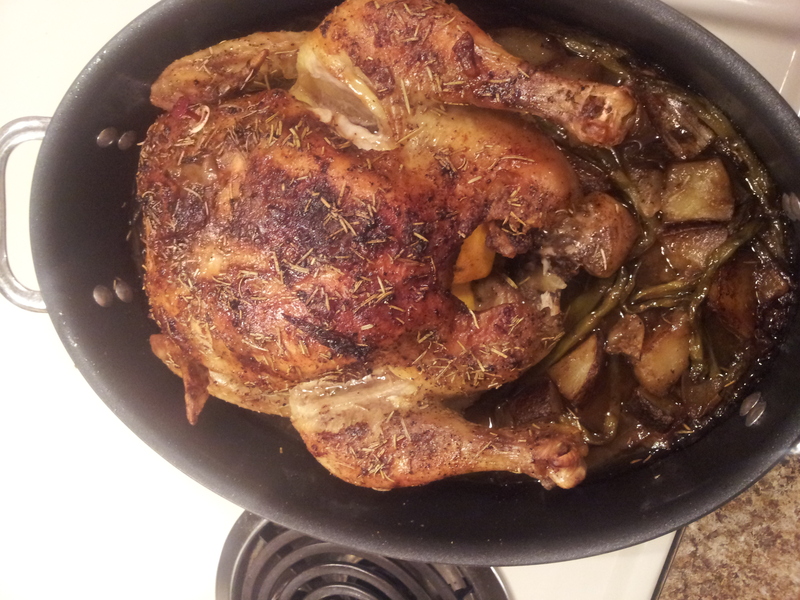 olive oil on one side of the chicken and rub on the skin with your hands. Add some kosher salt, black pepper and rosemary. Rub that in as well. 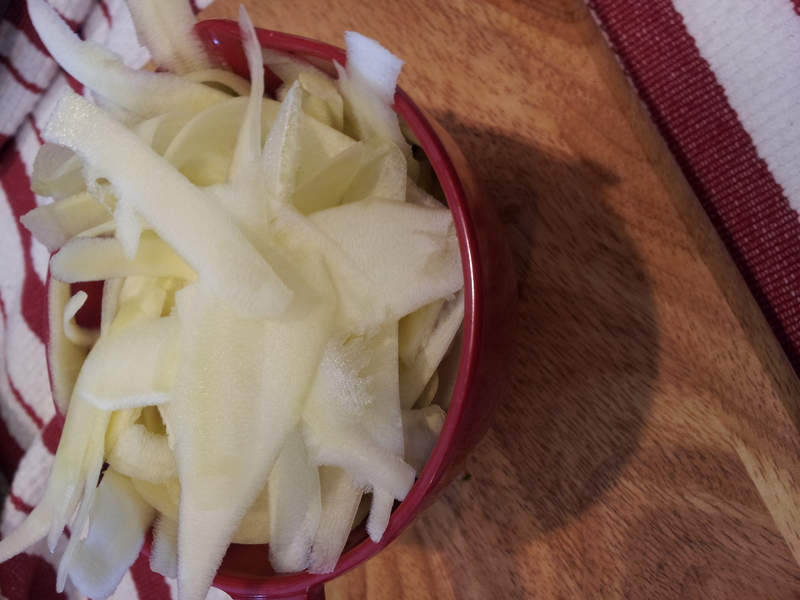 Using a sharp knife, make 2 incisions in the skin (about 1/2 inch wide) and smear a little softened butter in there, along with some garlic, rosemary and kosher salt. 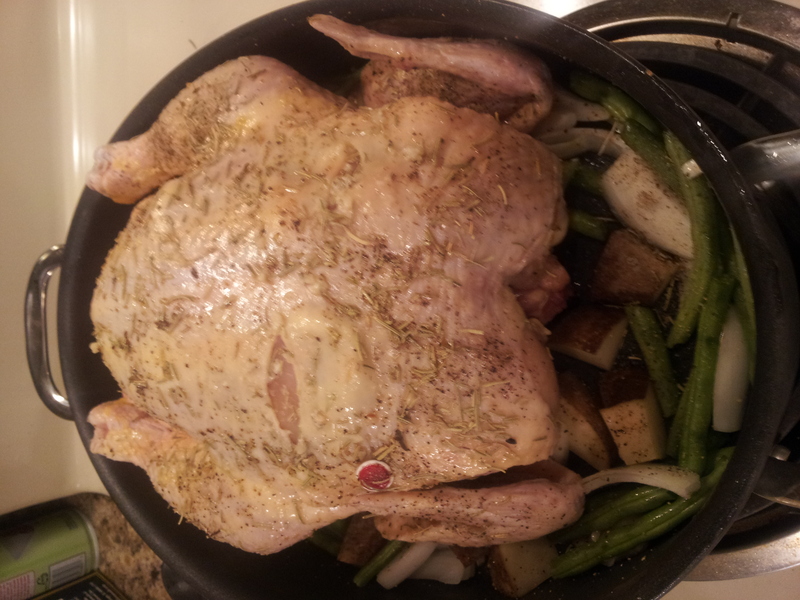 Flip the bird (hee hee) and repeat, making sure the skin has a nice coating of olive oil and seasoning. 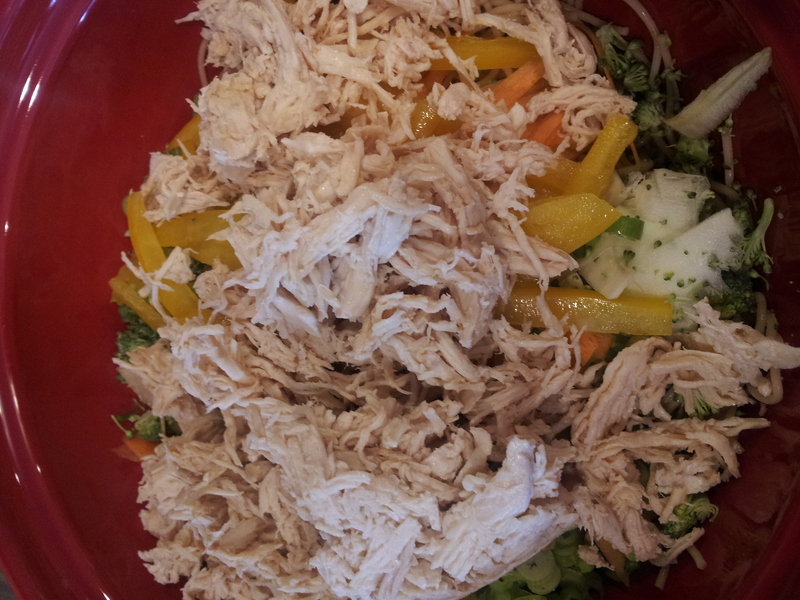 Place chicken in the roasting pan breast side up (I placed mine on top of veggies – if you don’t, maybe add just 1-2 Tbsp. 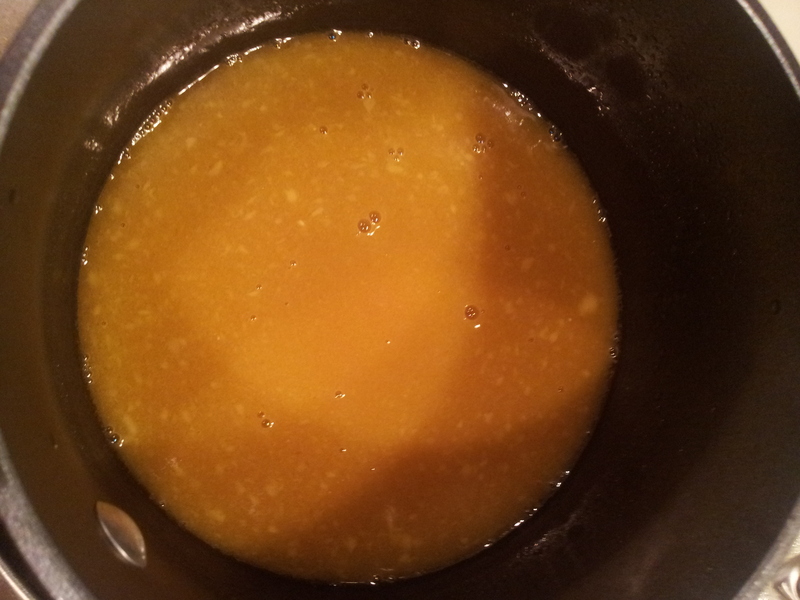 liquid like chicken broth) and cook according to directions on the chicken. Mine took about 1 1/2 hours to cook through. Baste every 20-30 minutes. If your chicken starts browning, make a little tent with aluminum foil to prevent it from burning. A nice crispy skin is good, but burnt skin is not. (Says the girl with bright pink shoulders). 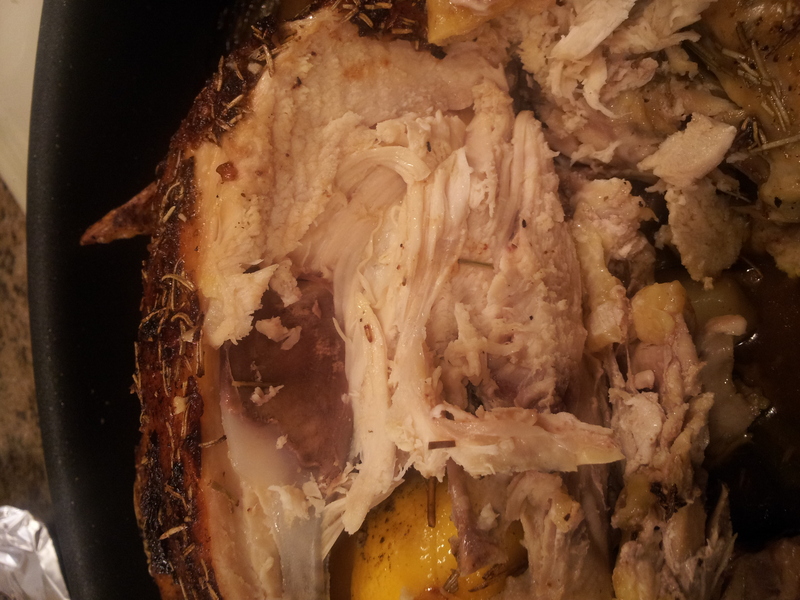 Remove chicken from oven and let sit 10 minutes before carving. You can test to see if it is done by cutting the base of the leg – if the juices run clear, it’s ready! Carve the chicken and serve with your delicious roasted veggies which have absorbed all of the citrus-herb-butter-olive oil liquid. Sorry again for being M.I.A. 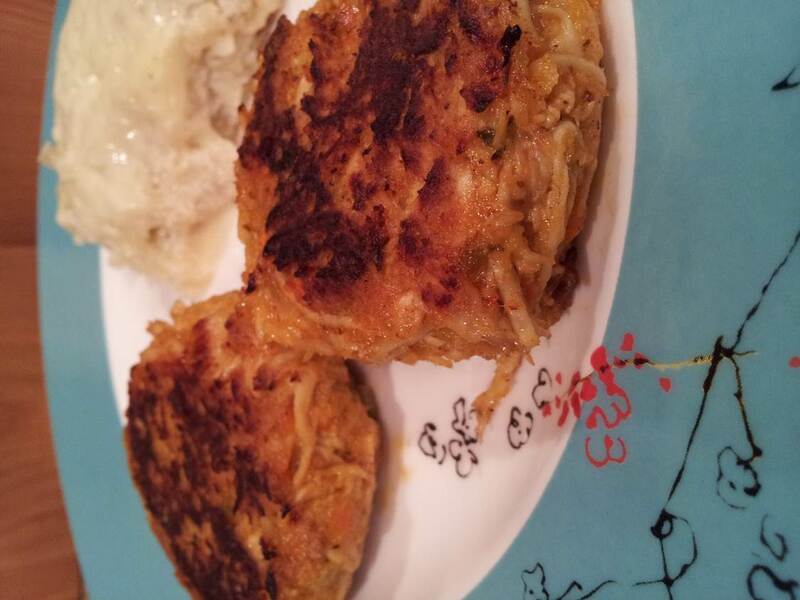 the past week – I promise I’ll make it up to you with some more delicious recipes this week!